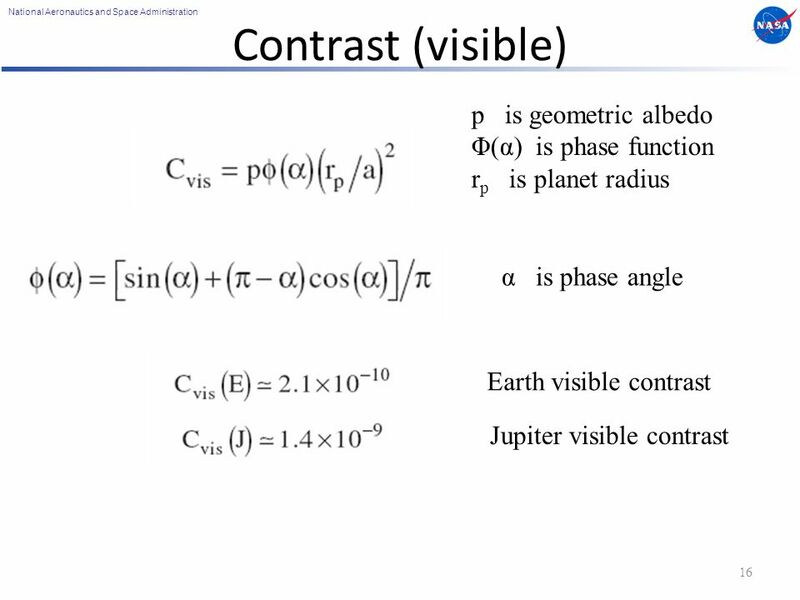 National Aeronautics and Space Administration 1 Traub Principles of Coronagraphy Wesley A. Traub Jet Propulsion Laboratory, California Institute of Technology. 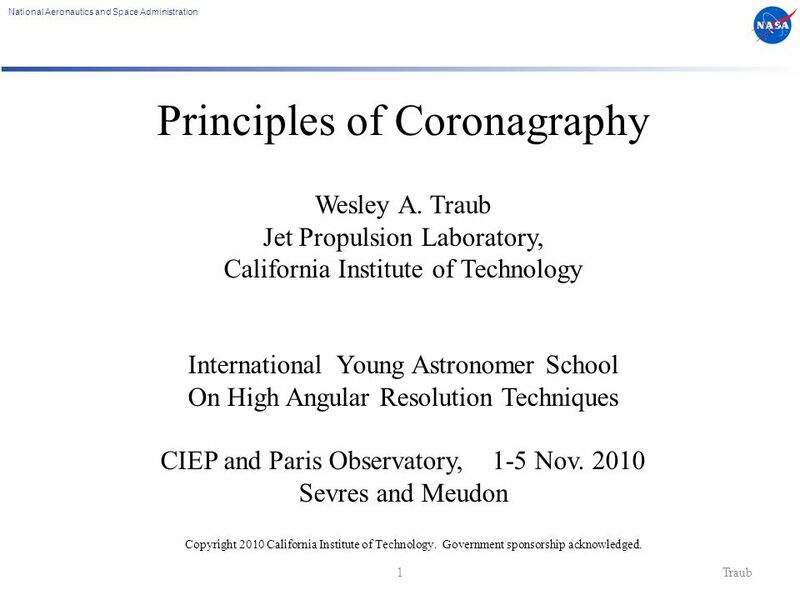 1 National Aeronautics and Space Administration 1 Traub Principles of Coronagraphy Wesley A. Traub Jet Propulsion Laboratory, California Institute of Technology International Young Astronomer School On High Angular Resolution Techniques CIEP and Paris Observatory, 1-5 Nov. 2010 Sevres and Meudon Copyright 2010 California Institute of Technology. Government sponsorship acknowledged. 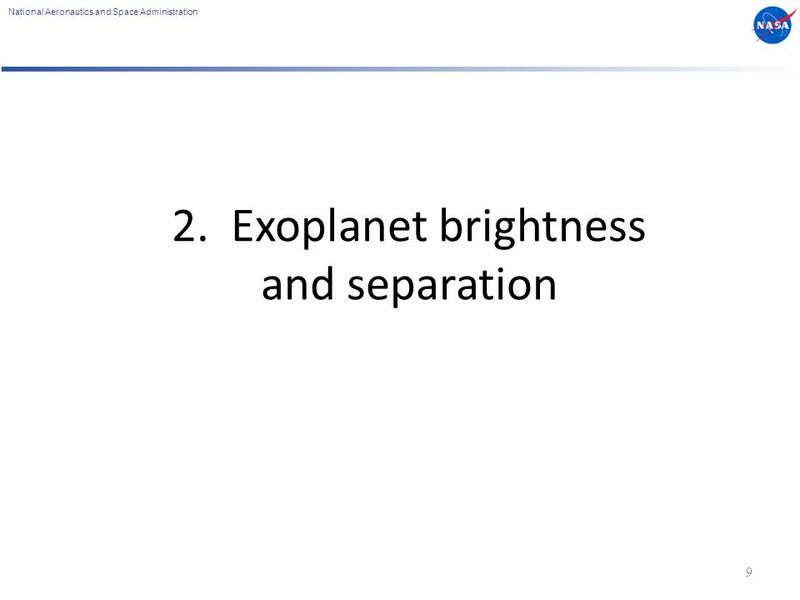 2 National Aeronautics and Space Administration Outline 2 1.Introduction 2.Exoplanet Brightness and Separation 3.Photons as Waves and Particles 4.Coronagraph and Interferometer Concepts 5. 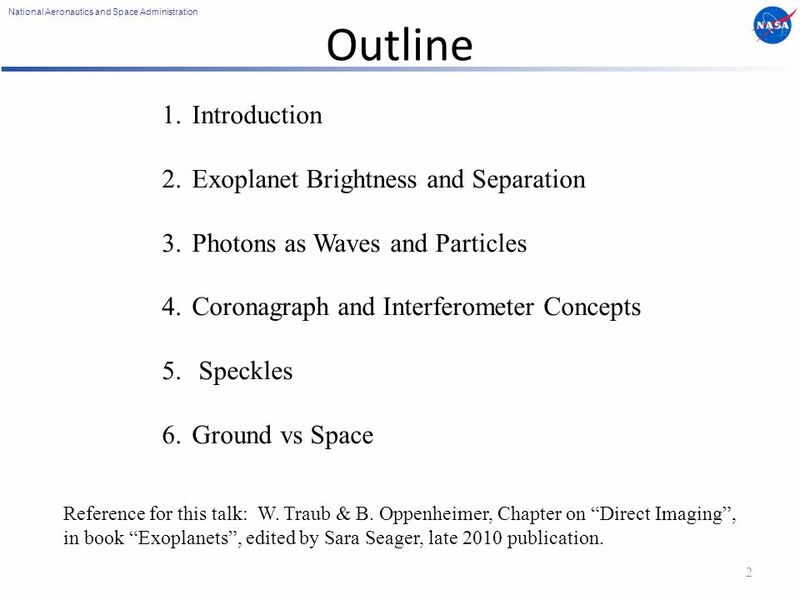 Speckles 6.Ground vs Space Reference for this talk: W. Traub & B. Oppenheimer, Chapter on “Direct Imaging”, in book “Exoplanets”, edited by Sara Seager, late 2010 publication. 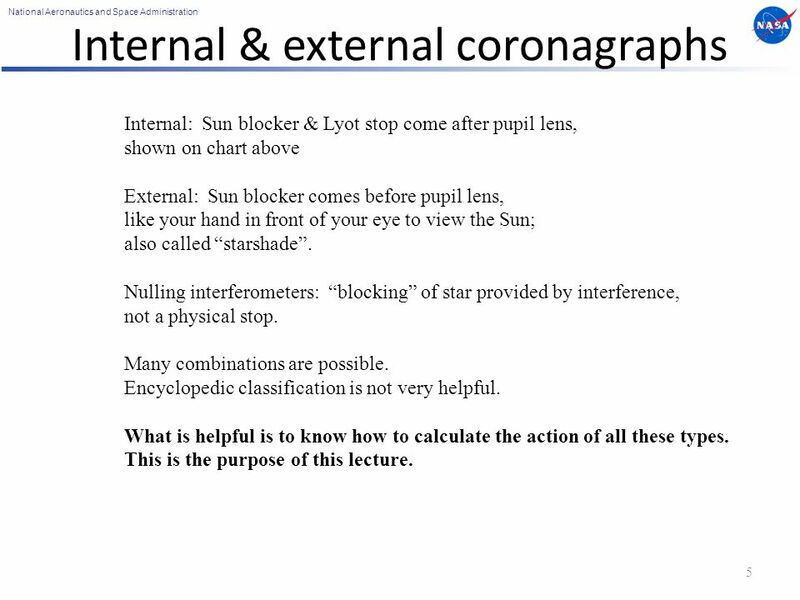 5 National Aeronautics and Space Administration Internal & external coronagraphs 5 Internal: Sun blocker & Lyot stop come after pupil lens, shown on chart above External: Sun blocker comes before pupil lens, like your hand in front of your eye to view the Sun; also called “starshade”. 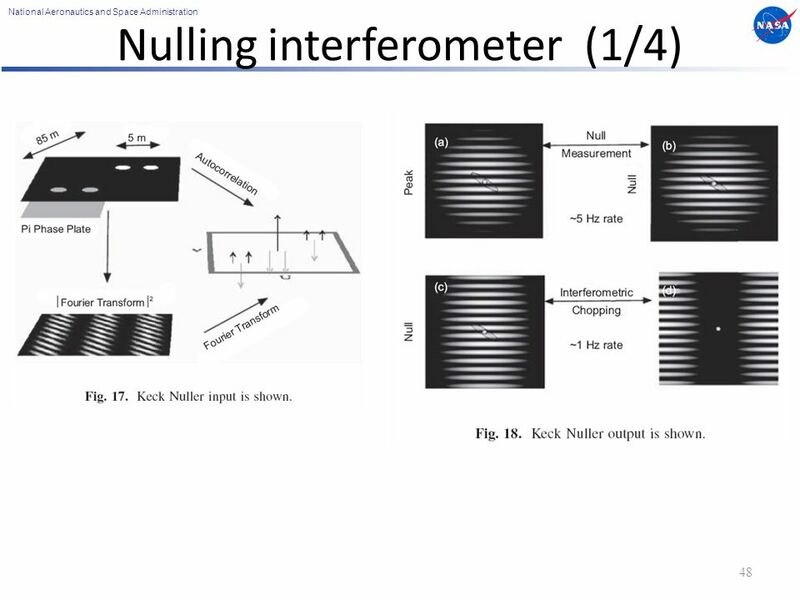 Nulling interferometers: “blocking” of star provided by interference, not a physical stop. Many combinations are possible. Encyclopedic classification is not very helpful. What is helpful is to know how to calculate the action of all these types. This is the purpose of this lecture. 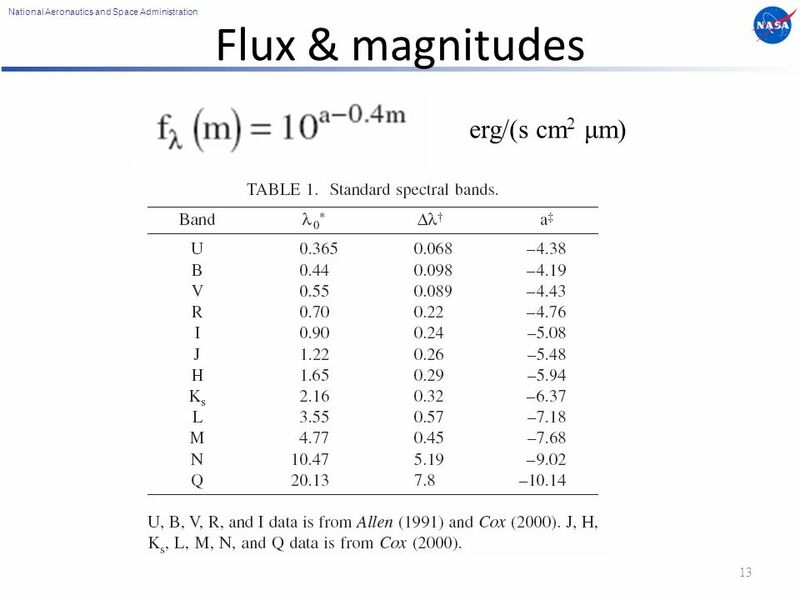 10 National Aeronautics and Space Administration Specific intensity 10 erg/(s cm 2 Hz sr) erg/(s cm 2 cm sr) You can change from one to the other using B λ dλ = B ν dν and λν = c.
20 National Aeronautics and Space Administration Color and spectra 20 “color” means low (R ~ 5) spectral resolution, e.g., U, B, V, R, I etc. 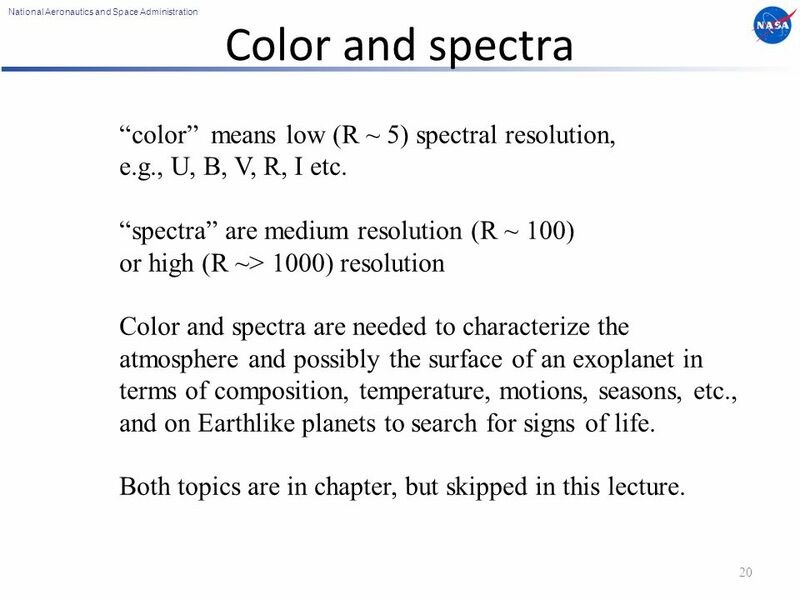 “spectra” are medium resolution (R ~ 100) or high (R ~> 1000) resolution Color and spectra are needed to characterize the atmosphere and possibly the surface of an exoplanet in terms of composition, temperature, motions, seasons, etc., and on Earthlike planets to search for signs of life. Both topics are in chapter, but skipped in this lecture. 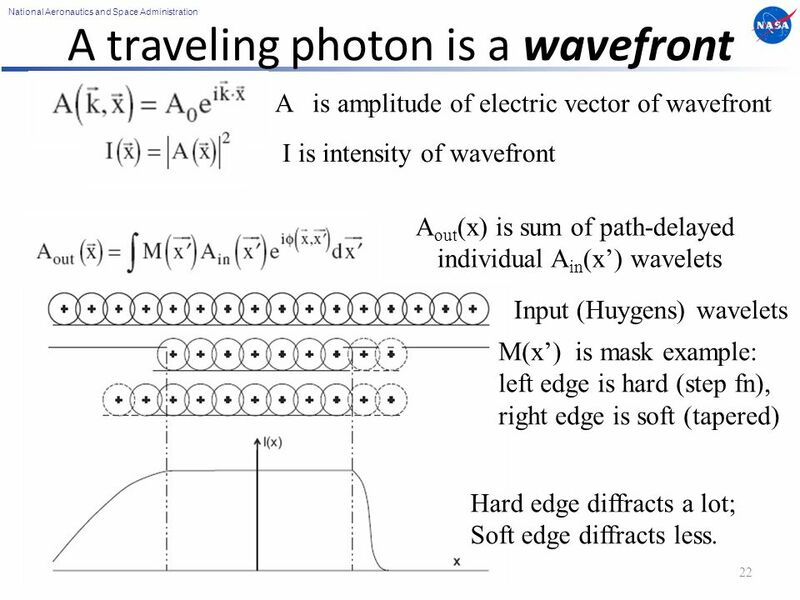 22 National Aeronautics and Space Administration A traveling photon is a wavefront 22 A is amplitude of electric vector of wavefront I is intensity of wavefront A out (x) is sum of path-delayed individual A in (x’) wavelets Input (Huygens) wavelets M(x’) is mask example: left edge is hard (step fn), right edge is soft (tapered) Hard edge diffracts a lot; Soft edge diffracts less. 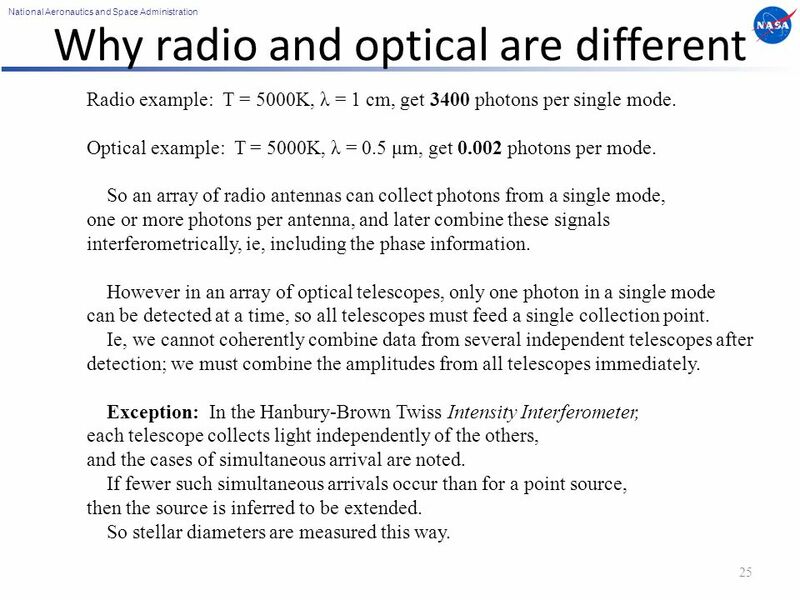 25 National Aeronautics and Space Administration Why radio and optical are different 25 Radio example: T = 5000K, λ = 1 cm, get 3400 photons per single mode. 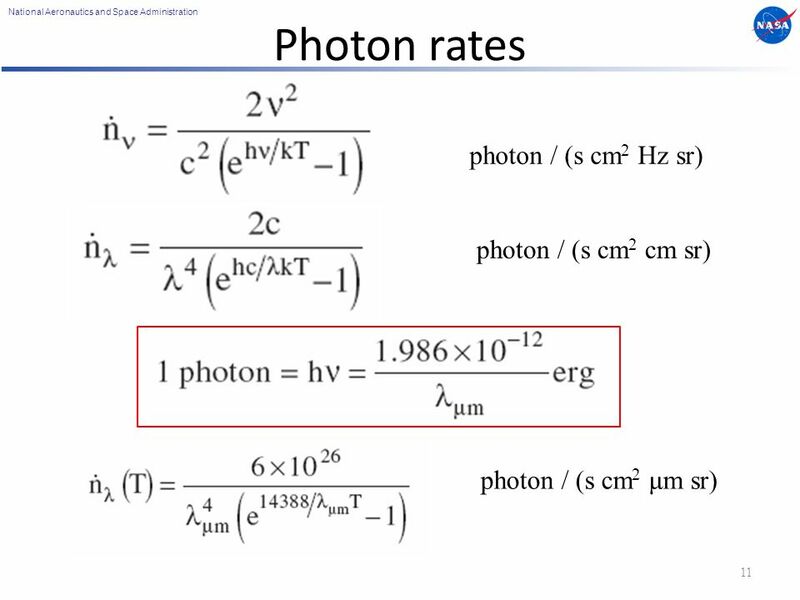 Optical example: T = 5000K, λ = 0.5 μm, get 0.002 photons per mode. 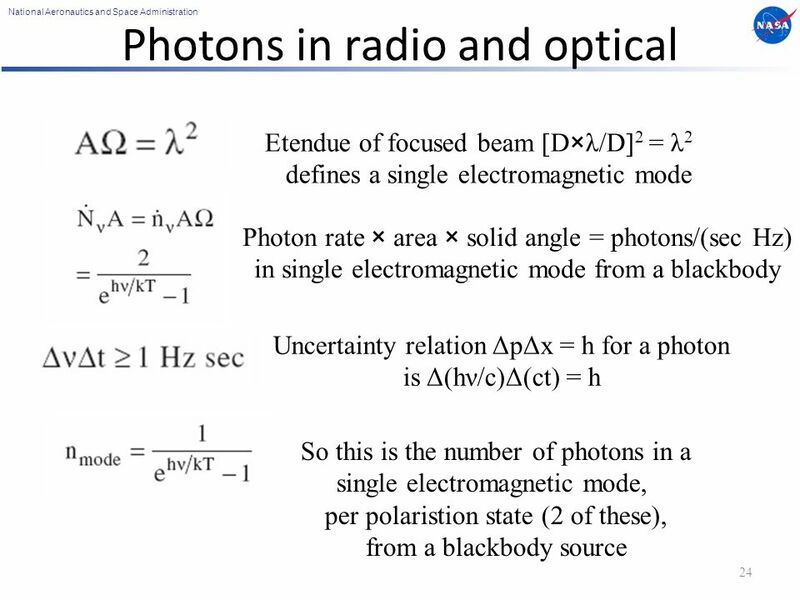 So an array of radio antennas can collect photons from a single mode, one or more photons per antenna, and later combine these signals interferometrically, ie, including the phase information. 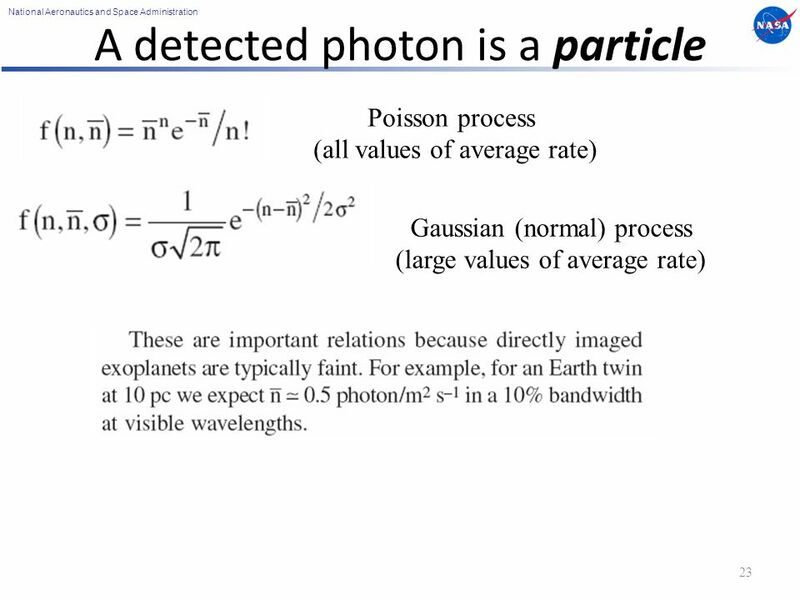 However in an array of optical telescopes, only one photon in a single mode can be detected at a time, so all telescopes must feed a single collection point. 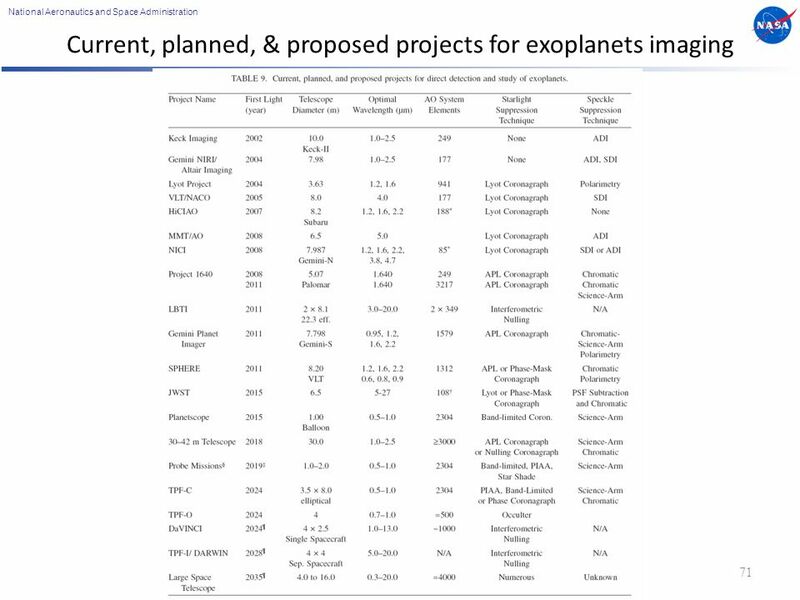 Ie, we cannot coherently combine data from several independent telescopes after detection; we must combine the amplitudes from all telescopes immediately. Exception: In the Hanbury-Brown Twiss Intensity Interferometer, each telescope collects light independently of the others, and the cases of simultaneous arrival are noted. If fewer such simultaneous arrivals occur than for a point source, then the source is inferred to be extended. 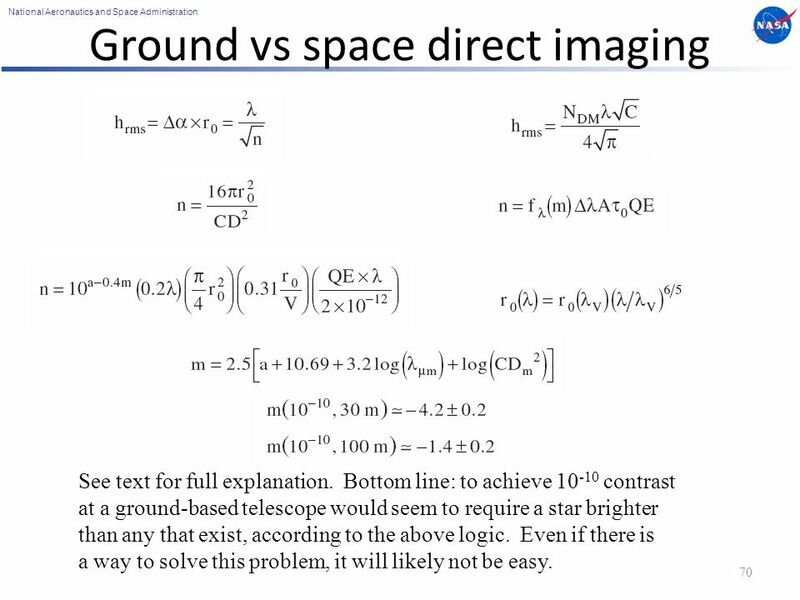 So stellar diameters are measured this way. 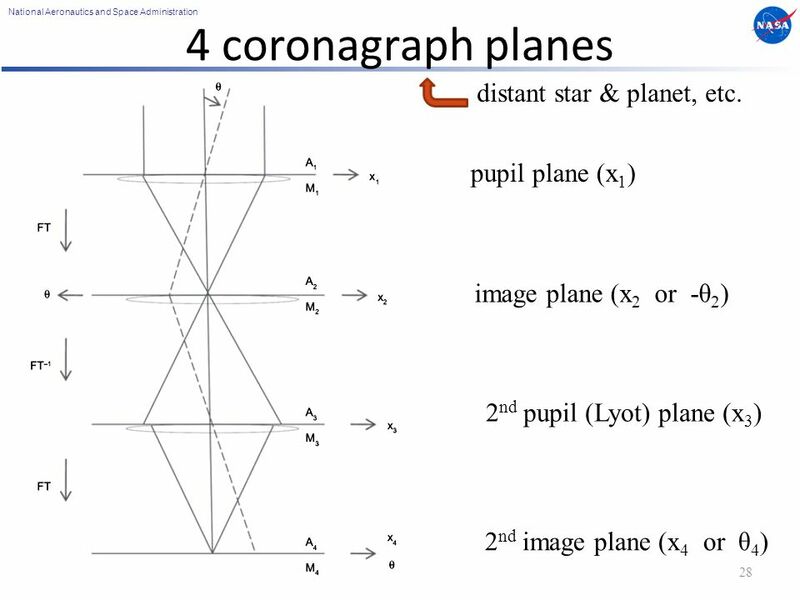 28 National Aeronautics and Space Administration 4 coronagraph planes 28 pupil plane (x 1 ) image plane (x 2 or -θ 2 ) 2 nd image plane (x 4 or θ 4 ) 2 nd pupil (Lyot) plane (x 3 ) distant star & planet, etc. 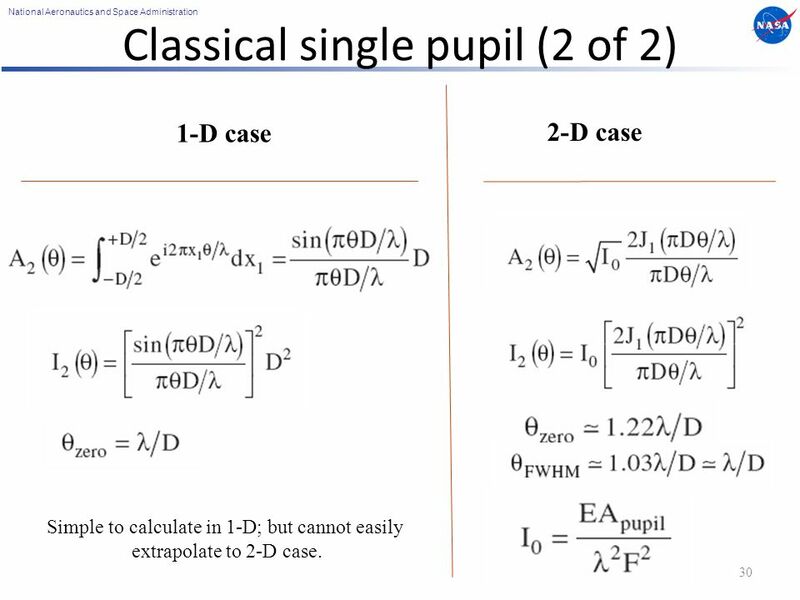 30 National Aeronautics and Space Administration Classical single pupil (2 of 2) 30 1-D case 2-D case Simple to calculate in 1-D; but cannot easily extrapolate to 2-D case. 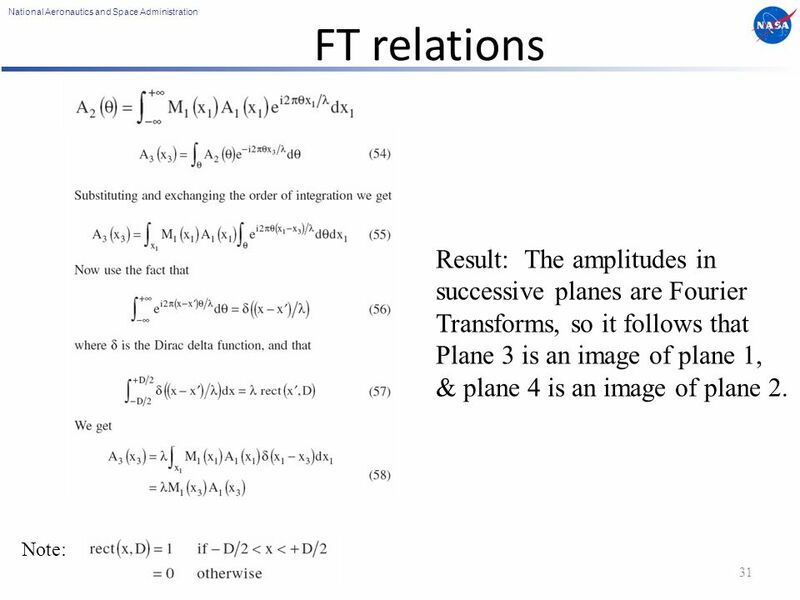 31 National Aeronautics and Space Administration FT relations 31 Note: Result: The amplitudes in successive planes are Fourier Transforms, so it follows that Plane 3 is an image of plane 1, & plane 4 is an image of plane 2. 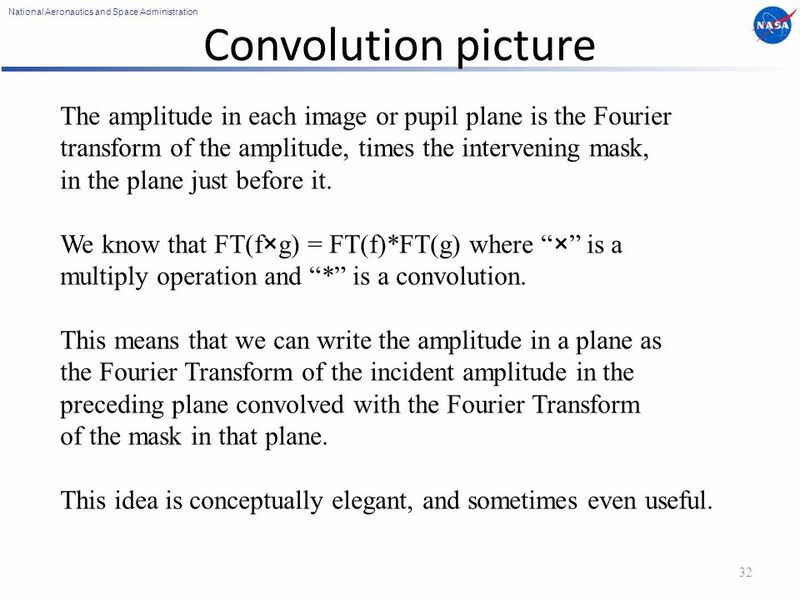 32 National Aeronautics and Space Administration Convolution picture 32 The amplitude in each image or pupil plane is the Fourier transform of the amplitude, times the intervening mask, in the plane just before it. We know that FT(f×g) = FT(f)*FT(g) where “×” is a multiply operation and “*” is a convolution. 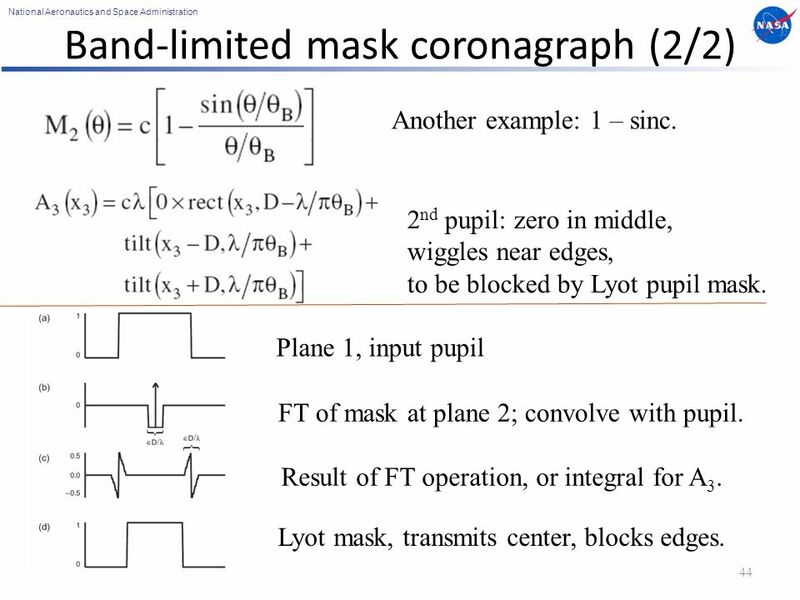 This means that we can write the amplitude in a plane as the Fourier Transform of the incident amplitude in the preceding plane convolved with the Fourier Transform of the mask in that plane. This idea is conceptually elegant, and sometimes even useful. 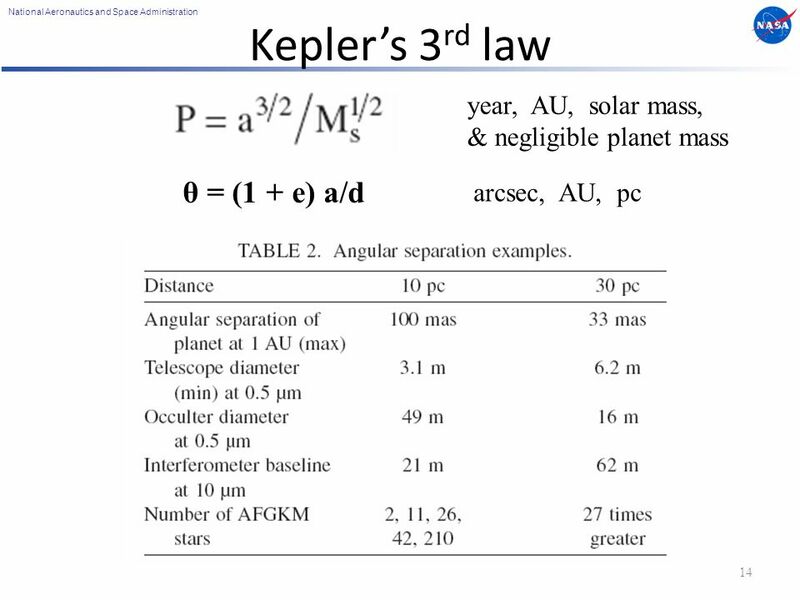 34 National Aeronautics and Space Administration Practical considerations 34 Kramers-Kronig relation says that an absorption always has a related phase shift (and vice versa). 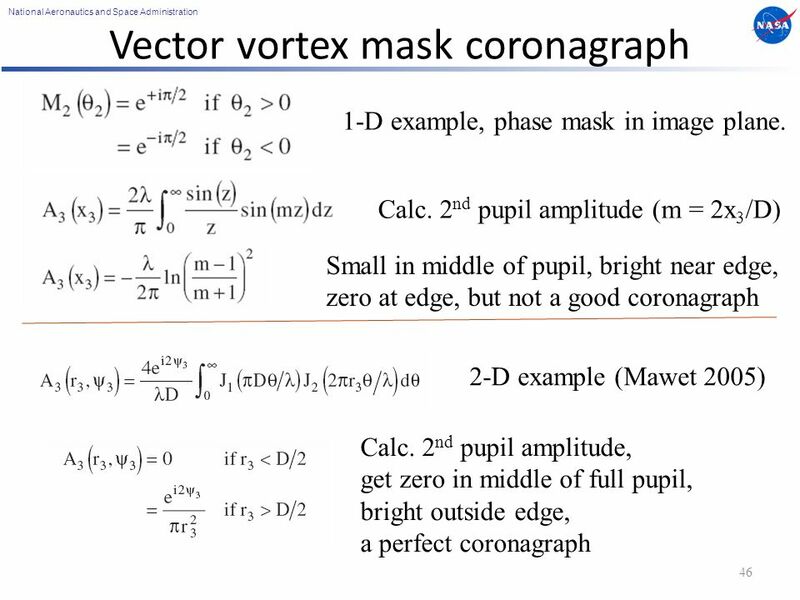 So when you deposit an absorbing or reflecting metal spot on a mask, there will be an automatic phase shift that occurs to the passing wavefront. 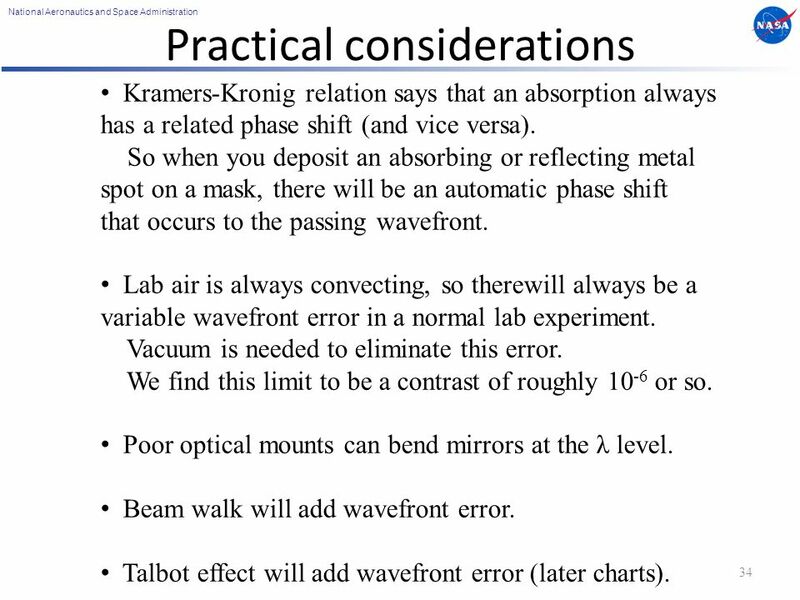 Lab air is always convecting, so therewill always be a variable wavefront error in a normal lab experiment. Vacuum is needed to eliminate this error. We find this limit to be a contrast of roughly 10 -6 or so. Poor optical mounts can bend mirrors at the λ level. Beam walk will add wavefront error. Talbot effect will add wavefront error (later charts). 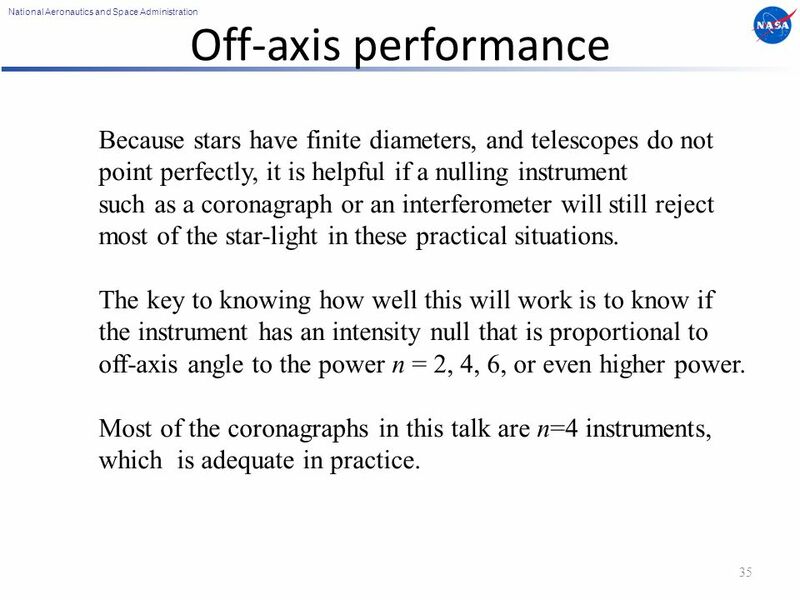 35 National Aeronautics and Space Administration Off-axis performance 35 Because stars have finite diameters, and telescopes do not point perfectly, it is helpful if a nulling instrument such as a coronagraph or an interferometer will still reject most of the star-light in these practical situations. 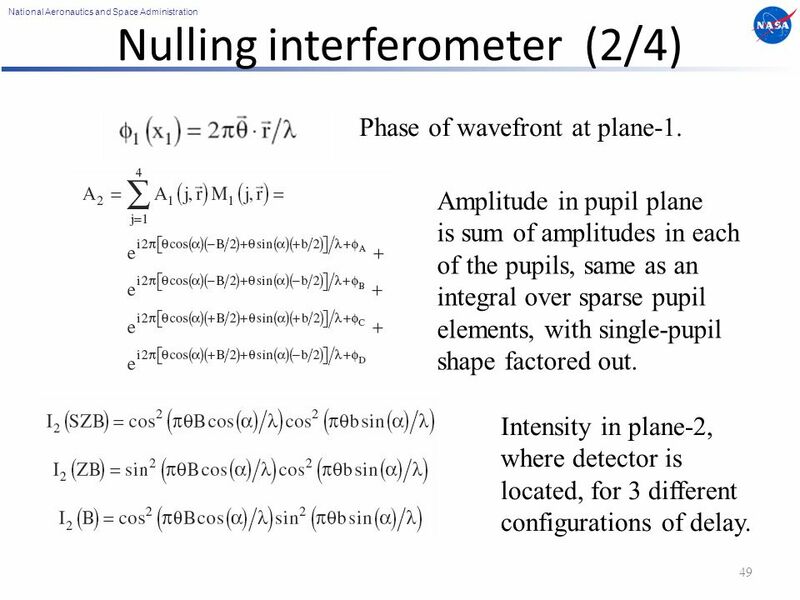 The key to knowing how well this will work is to know if the instrument has an intensity null that is proportional to off-axis angle to the power n = 2, 4, 6, or even higher power. 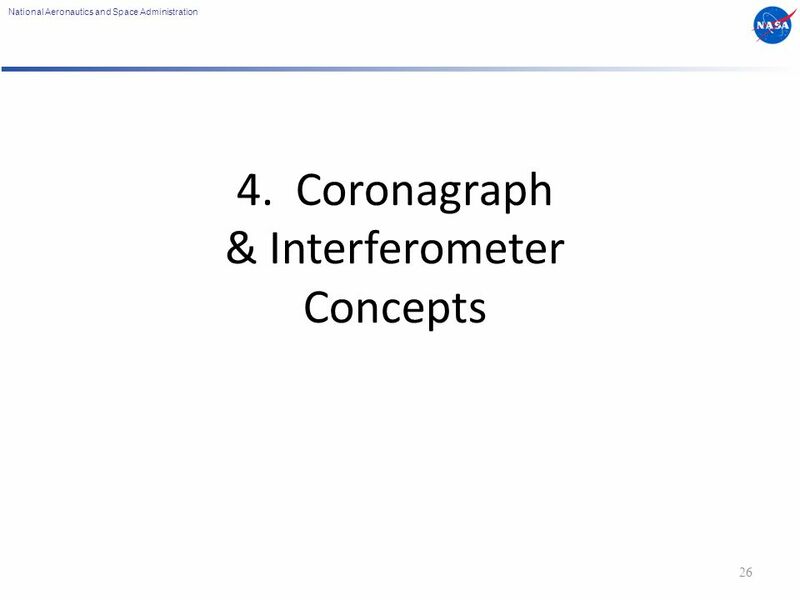 Most of the coronagraphs in this talk are n=4 instruments, which is adequate in practice. 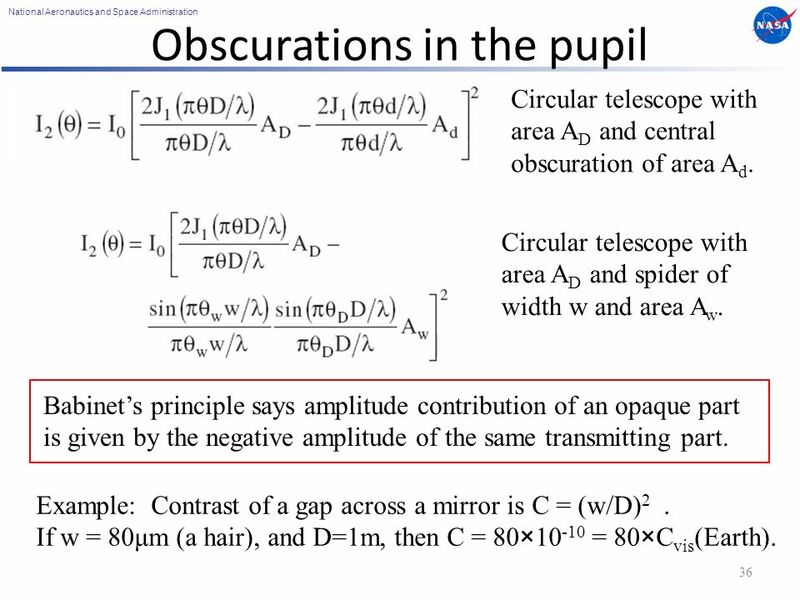 36 National Aeronautics and Space Administration Obscurations in the pupil 36 Circular telescope with area A D and central obscuration of area A d. Circular telescope with area A D and spider of width w and area A w. Babinet’s principle says amplitude contribution of an opaque part is given by the negative amplitude of the same transmitting part. Example: Contrast of a gap across a mirror is C = (w/D) 2. 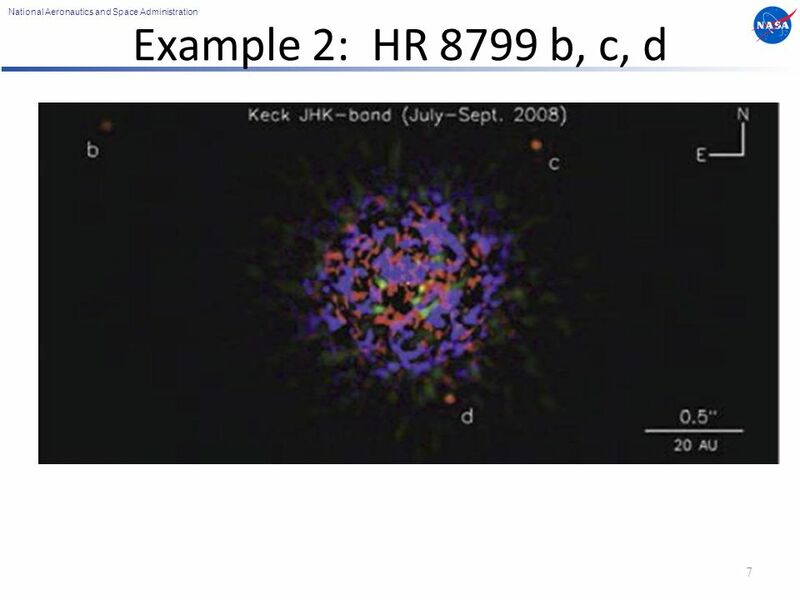 If w = 80μm (a hair), and D=1m, then C = 80×10 -10 = 80×C vis (Earth). 37 National Aeronautics and Space Administration Pupil apodization 37 We can minimize the Airy rings if we apodize (taper, or make to have “no feet”) the edge of the pupil. Suppose we taper the amplitude with black spray paint: A 1 (x 1 ) = exp[ -(x/x 0 ) 2 ] where x 0 < D/2. Then the image will have a Gaussian intensity pattern: This image will reach 10 -10 at θ = 2λ/D eff. So in principle this is a powerful technique. 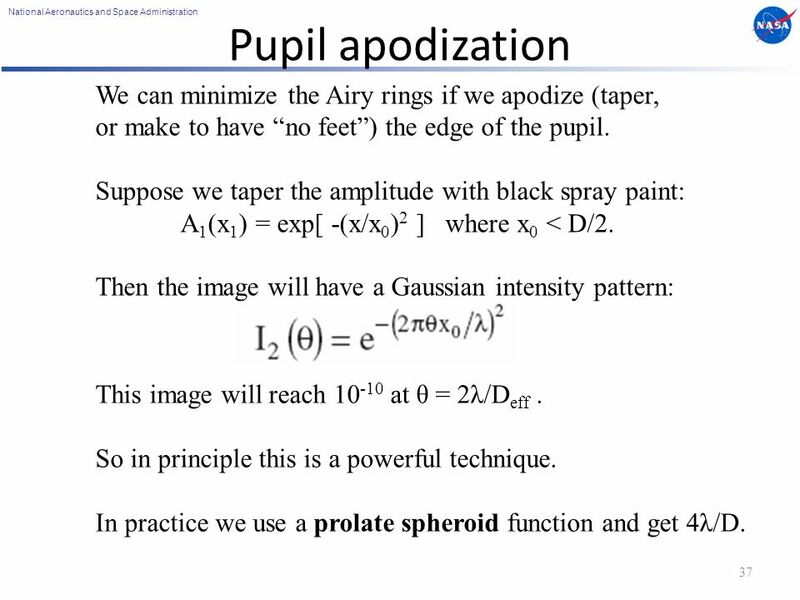 In practice we use a prolate spheroid function and get 4λ/D. 38 National Aeronautics and Space Administration Pupil masking 38 Here we replace continuous apodization with a discrete pattern. The nominal shape is a prolate spheroid function (D. Spergel). 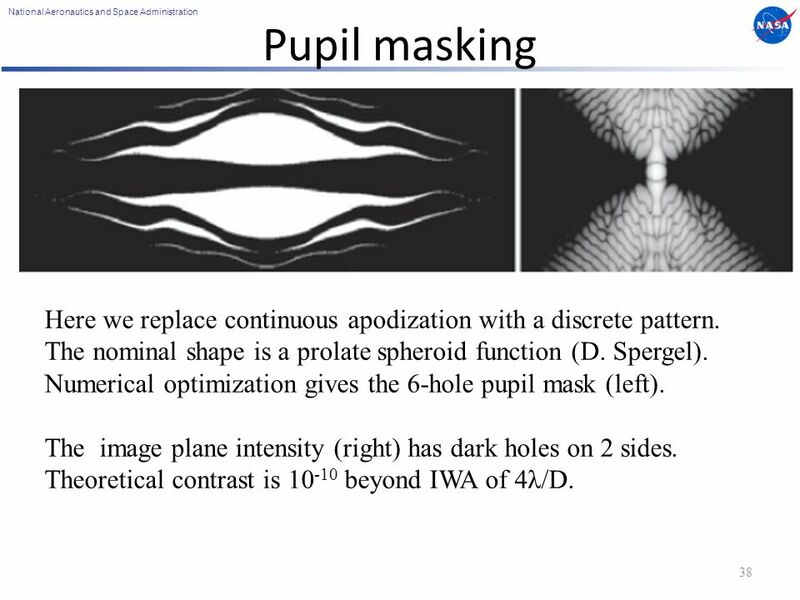 Numerical optimization gives the 6-hole pupil mask (left). The image plane intensity (right) has dark holes on 2 sides. Theoretical contrast is 10 -10 beyond IWA of 4λ/D. 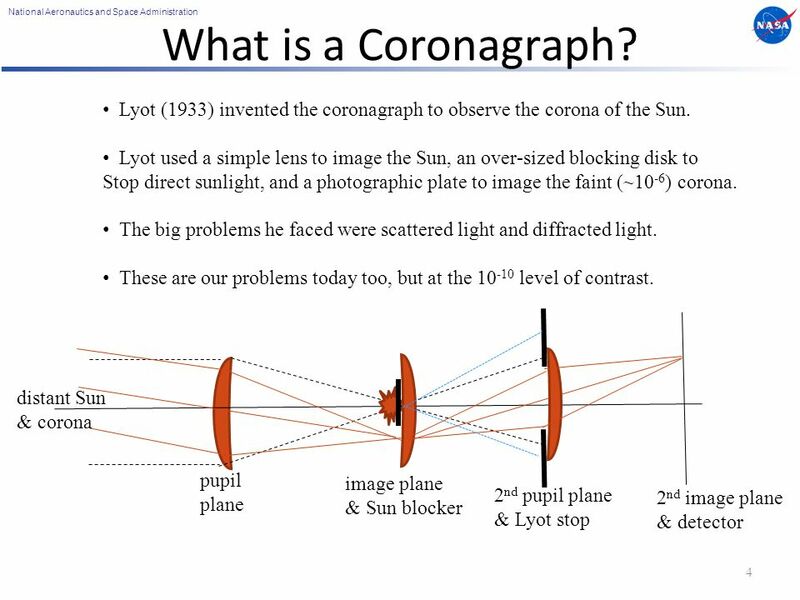 41 National Aeronautics and Space Administration Lyot (hard-edge) mask coronagraph 41 Assume an on-axis star (A 1 = 1). Get A 2 = Airy pattern, as usual. 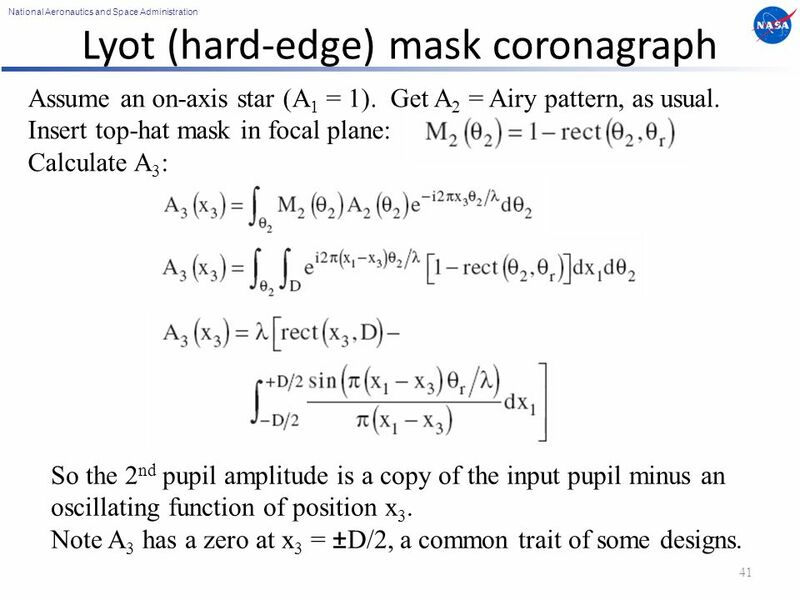 Insert top-hat mask in focal plane: Calculate A 3 : So the 2 nd pupil amplitude is a copy of the input pupil minus an oscillating function of position x 3. Note A 3 has a zero at x 3 = ±D/2, a common trait of some designs. 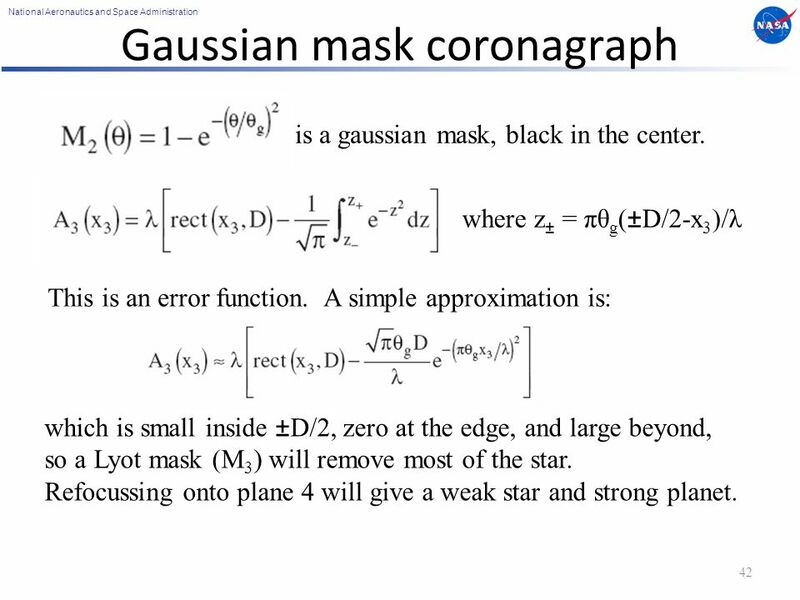 42 National Aeronautics and Space Administration Gaussian mask coronagraph 42 where z ± = πθ g (±D/2-x 3 )/λ is a gaussian mask, black in the center. This is an error function. A simple approximation is: which is small inside ±D/2, zero at the edge, and large beyond, so a Lyot mask (M 3 ) will remove most of the star. Refocussing onto plane 4 will give a weak star and strong planet. 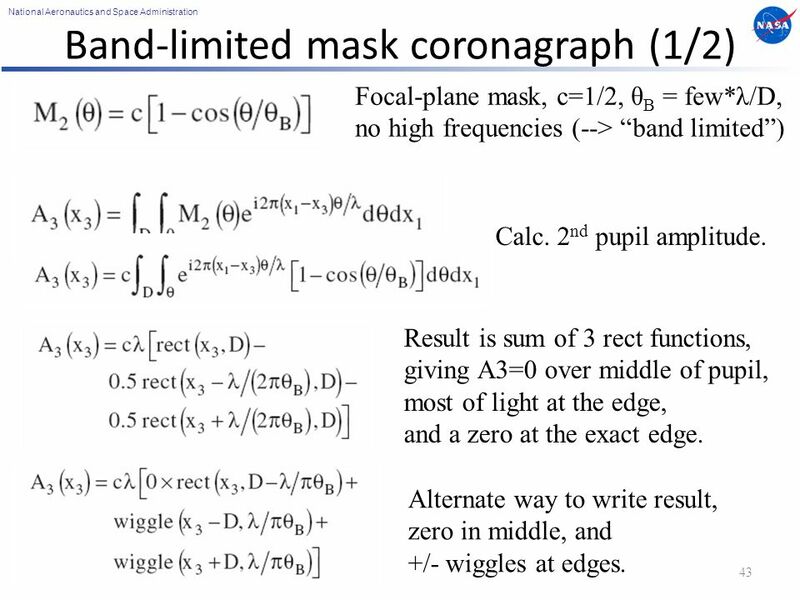 43 National Aeronautics and Space Administration Band-limited mask coronagraph (1/2) 43 Focal-plane mask, c=1/2, θ B = few*λ/D, no high frequencies (--> “band limited”) Calc. 2 nd pupil amplitude. Result is sum of 3 rect functions, giving A3=0 over middle of pupil, most of light at the edge, and a zero at the exact edge. Alternate way to write result, zero in middle, and +/- wiggles at edges. 44 National Aeronautics and Space Administration Band-limited mask coronagraph (2/2) 44 Another example: 1 – sinc. 2 nd pupil: zero in middle, wiggles near edges, to be blocked by Lyot pupil mask. Plane 1, input pupil FT of mask at plane 2; convolve with pupil. Result of FT operation, or integral for A 3. Lyot mask, transmits center, blocks edges. 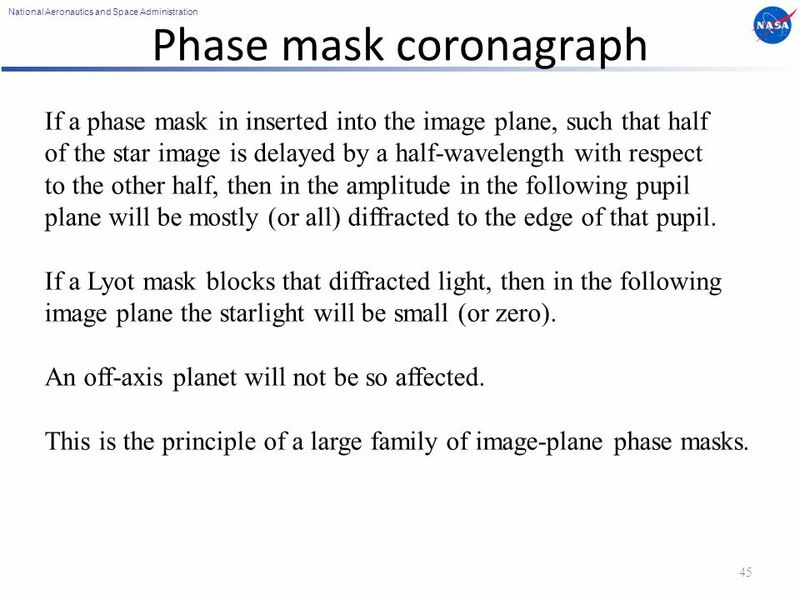 45 National Aeronautics and Space Administration Phase mask coronagraph 45 If a phase mask in inserted into the image plane, such that half of the star image is delayed by a half-wavelength with respect to the other half, then in the amplitude in the following pupil plane will be mostly (or all) diffracted to the edge of that pupil. 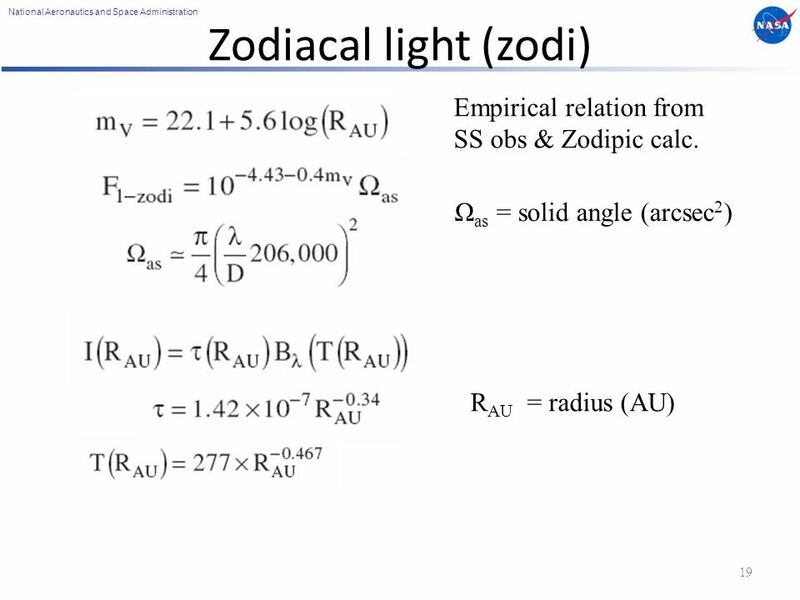 If a Lyot mask blocks that diffracted light, then in the following image plane the starlight will be small (or zero). An off-axis planet will not be so affected. This is the principle of a large family of image-plane phase masks. 47 National Aeronautics and Space Administration External occulter coronagraph 47 Mask is in plane-0, before the telescope, toward star. Original (hypergaussian) version is shown. IWA drives large size and distance of occulter. 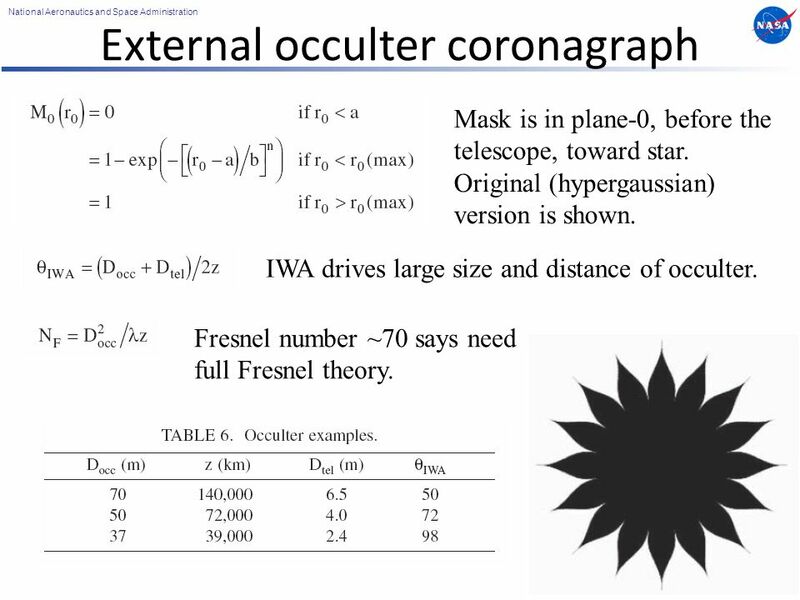 Fresnel number ~70 says need full Fresnel theory. 49 National Aeronautics and Space Administration Nulling interferometer (2/4) 49 Phase of wavefront at plane-1. 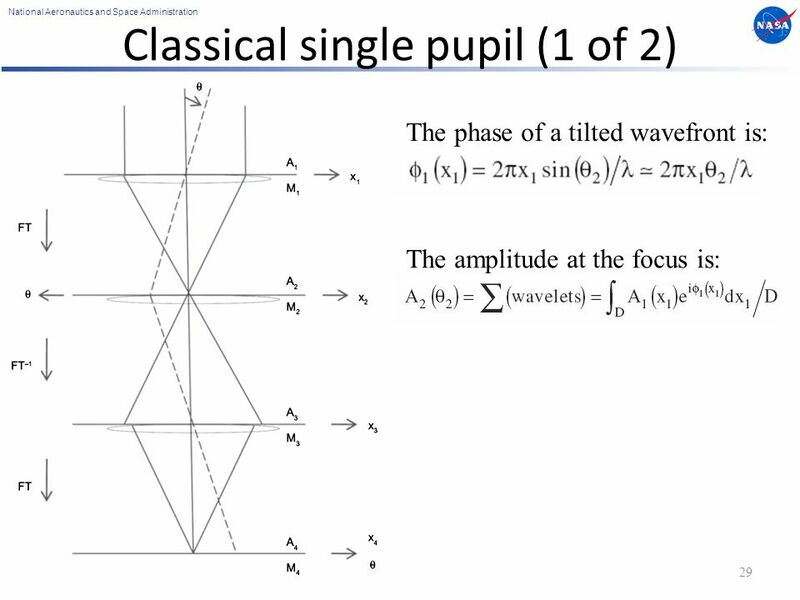 Amplitude in pupil plane is sum of amplitudes in each of the pupils, same as an integral over sparse pupil elements, with single-pupil shape factored out. Intensity in plane-2, where detector is located, for 3 different configurations of delay. 50 National Aeronautics and Space Administration Nulling interferometer (3/4) 50 3 different delays, rapid chopping. Star signal from this chop. 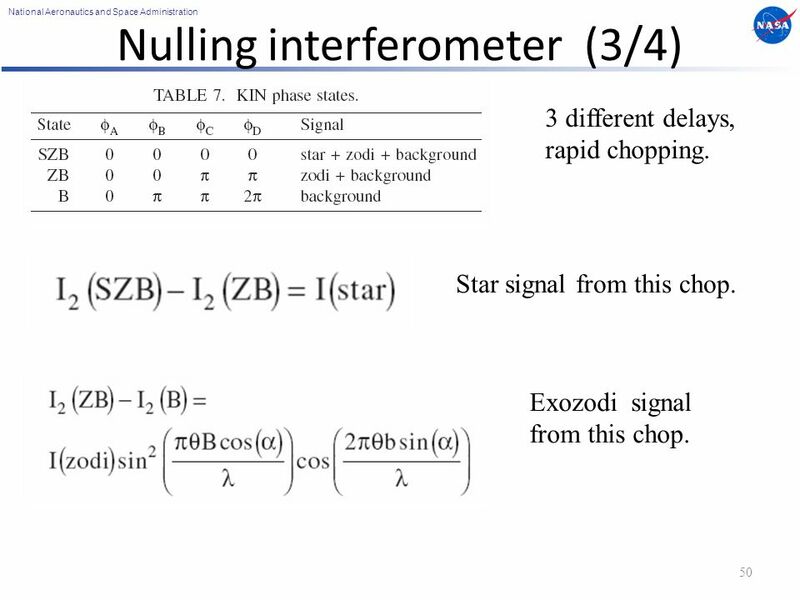 Exozodi signal from this chop. 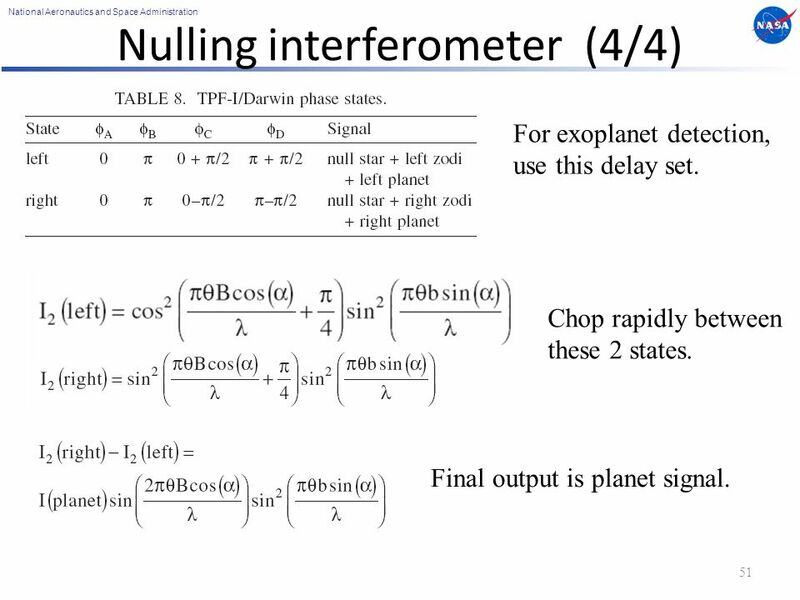 51 National Aeronautics and Space Administration Nulling interferometer (4/4) 51 For exoplanet detection, use this delay set. Chop rapidly between these 2 states. Final output is planet signal. 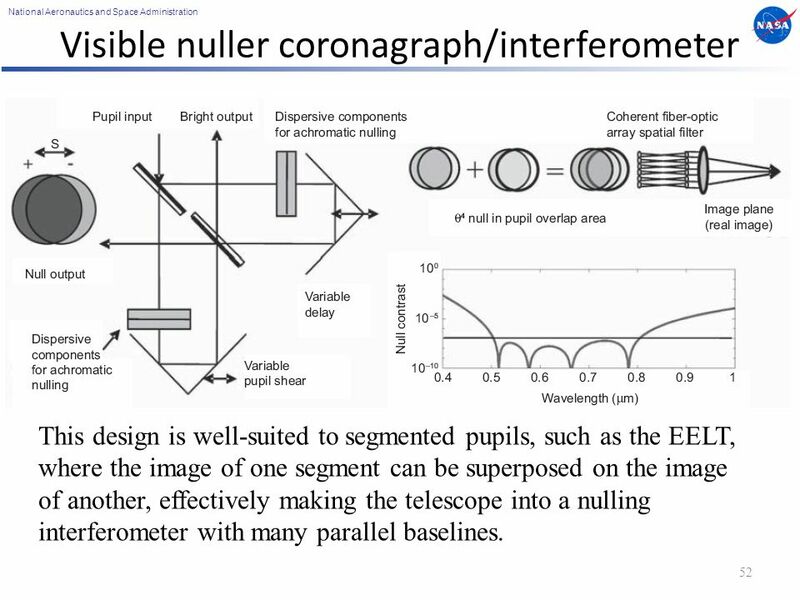 52 National Aeronautics and Space Administration Visible nuller coronagraph/interferometer 52 This design is well-suited to segmented pupils, such as the EELT, where the image of one segment can be superposed on the image of another, effectively making the telescope into a nulling interferometer with many parallel baselines. 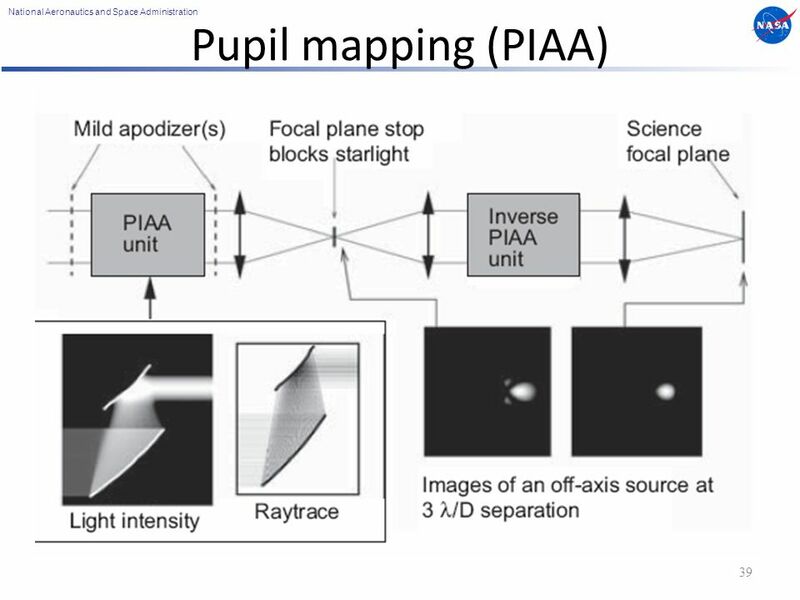 54 National Aeronautics and Space Administration Speckles from a phase step in pupil 54 Suppose we delay the wavefront by φ across half the telescope pupil. 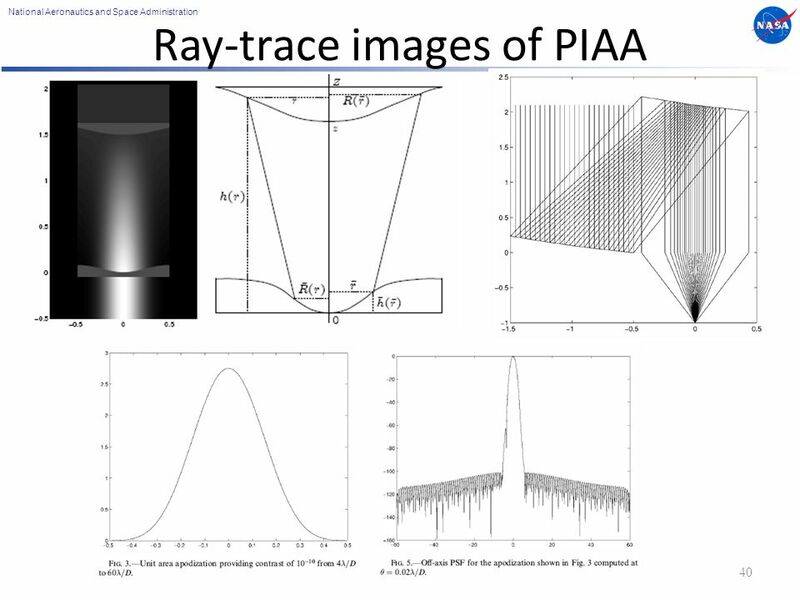 We get this image-plane amplitude If φ = 0, recover standard Airy pattern. 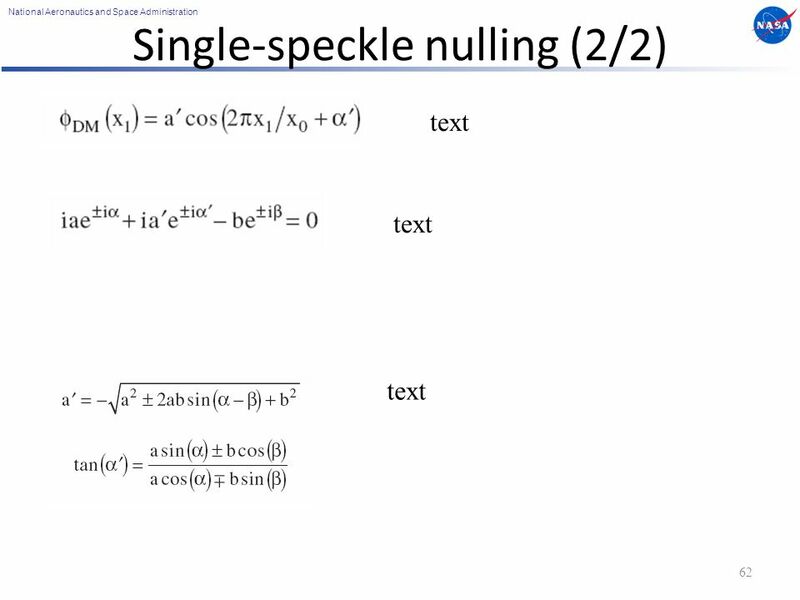 If φ = π, get 2 peaks, or speckles. 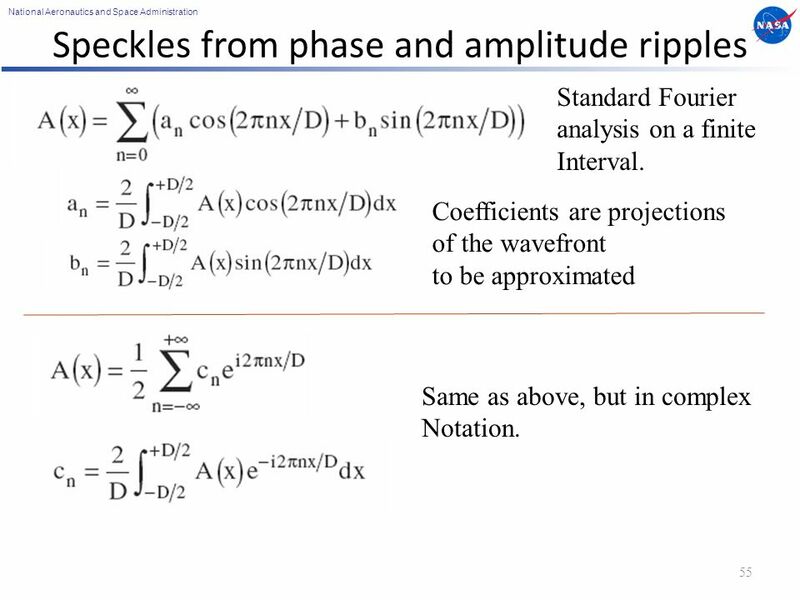 55 National Aeronautics and Space Administration Speckles from phase and amplitude ripples 55 Standard Fourier analysis on a finite Interval. Coefficients are projections of the wavefront to be approximated Same as above, but in complex Notation. 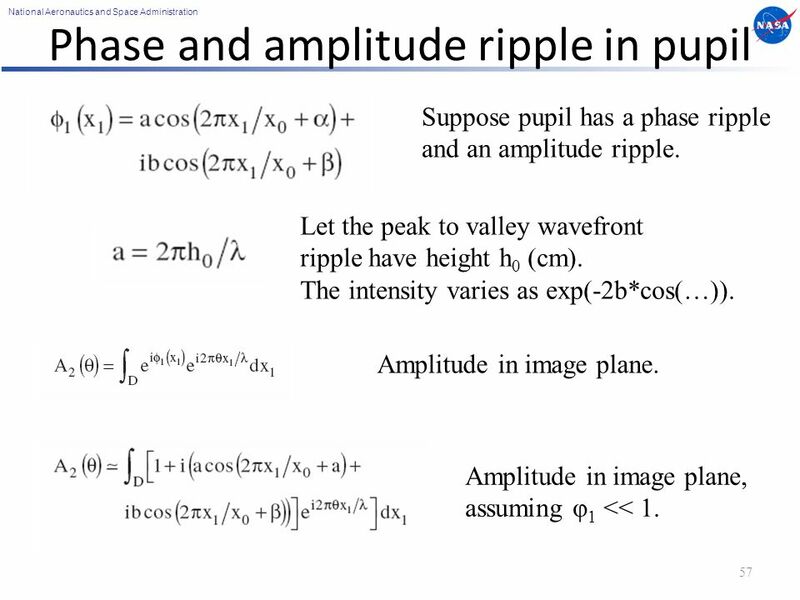 57 National Aeronautics and Space Administration Phase and amplitude ripple in pupil 57 Suppose pupil has a phase ripple and an amplitude ripple. Let the peak to valley wavefront ripple have height h 0 (cm). 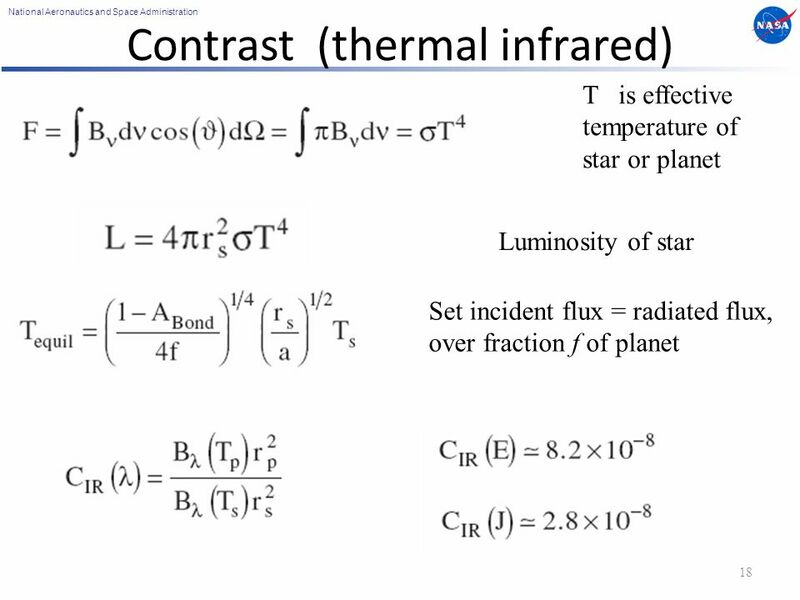 The intensity varies as exp(-2b*cos(…)). Amplitude in image plane. Amplitude in image plane, assuming φ 1 << 1. 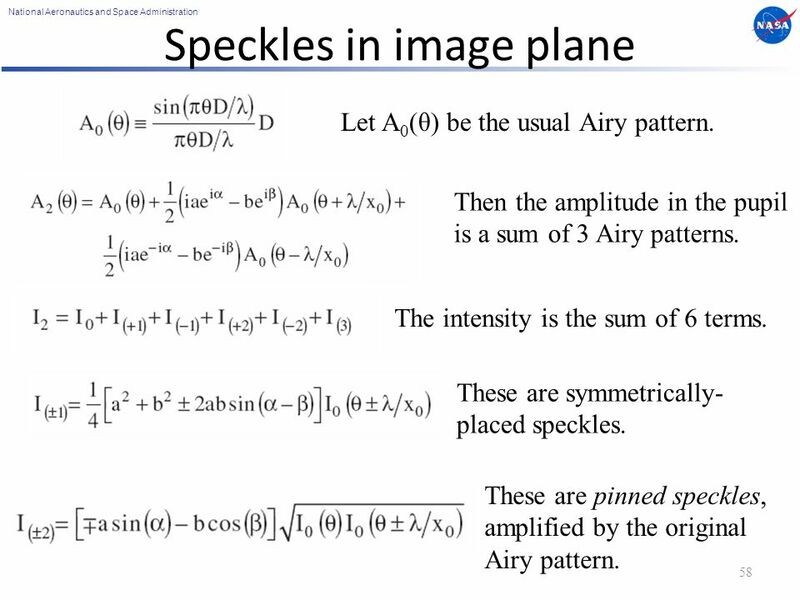 58 National Aeronautics and Space Administration Speckles in image plane 58 Let A 0 (θ) be the usual Airy pattern. Then the amplitude in the pupil is a sum of 3 Airy patterns. The intensity is the sum of 6 terms. 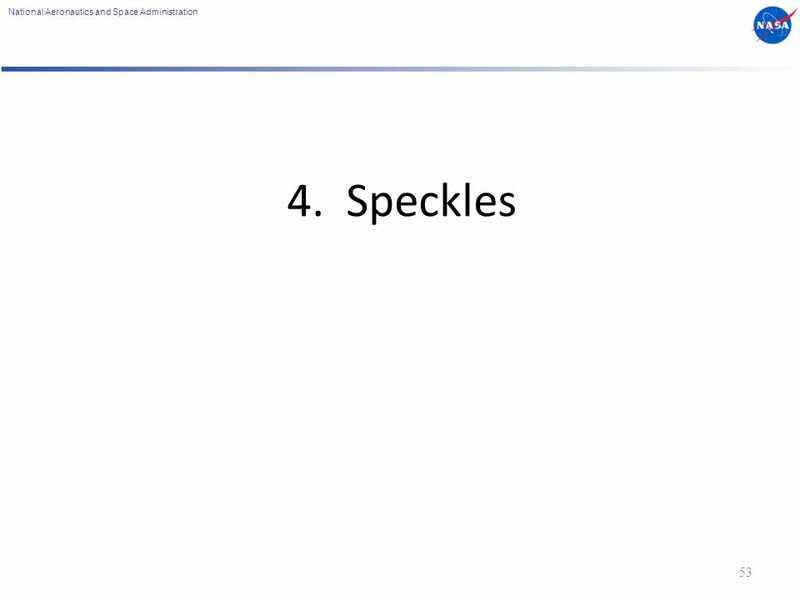 These are symmetrically- placed speckles. These are pinned speckles, amplified by the original Airy pattern. 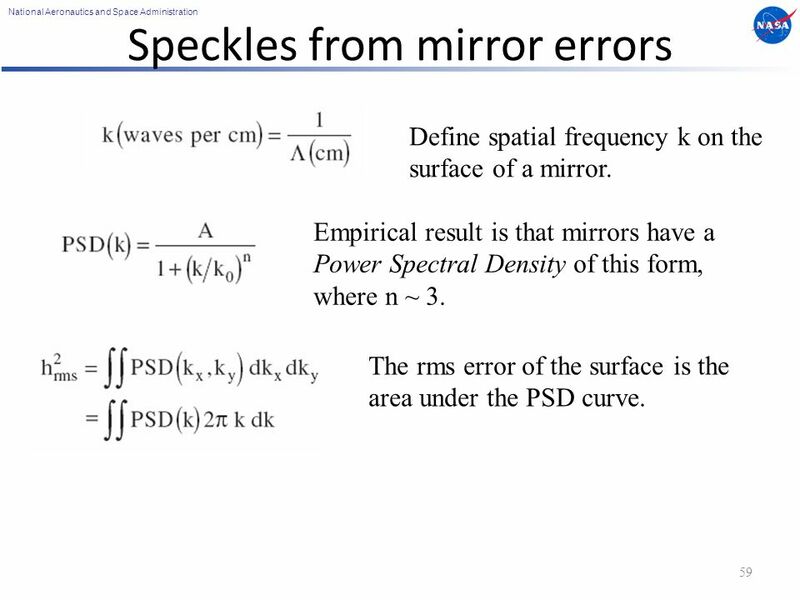 59 National Aeronautics and Space Administration Speckles from mirror errors 59 Define spatial frequency k on the surface of a mirror. 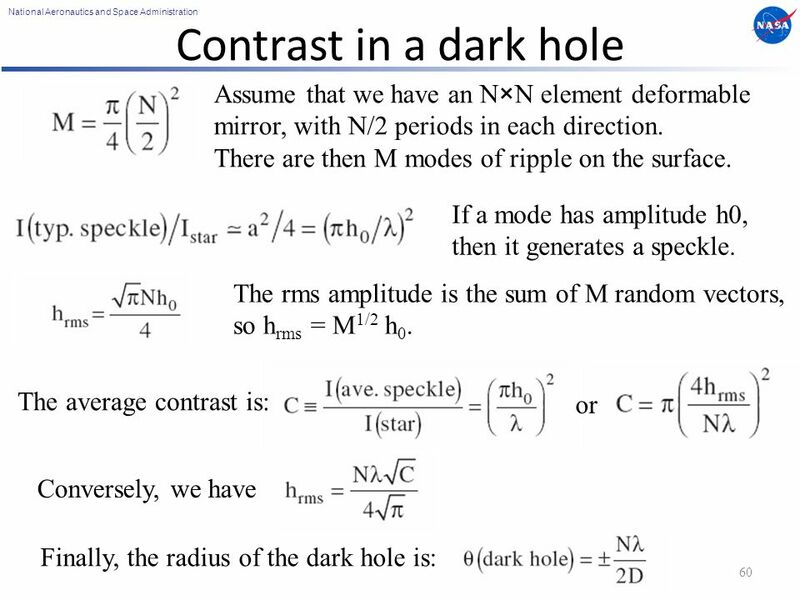 Empirical result is that mirrors have a Power Spectral Density of this form, where n ~ 3. The rms error of the surface is the area under the PSD curve. 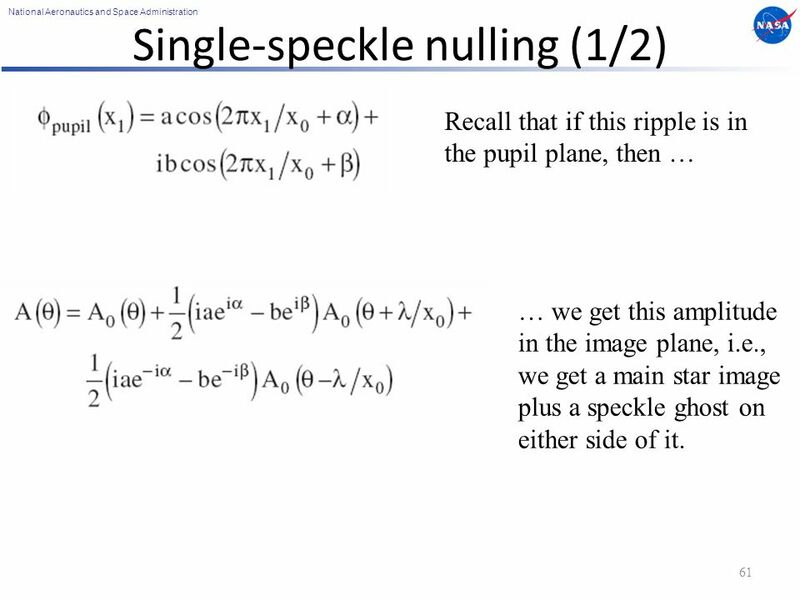 61 National Aeronautics and Space Administration Single-speckle nulling (1/2) 61 Recall that if this ripple is in the pupil plane, then … … we get this amplitude in the image plane, i.e., we get a main star image plus a speckle ghost on either side of it. 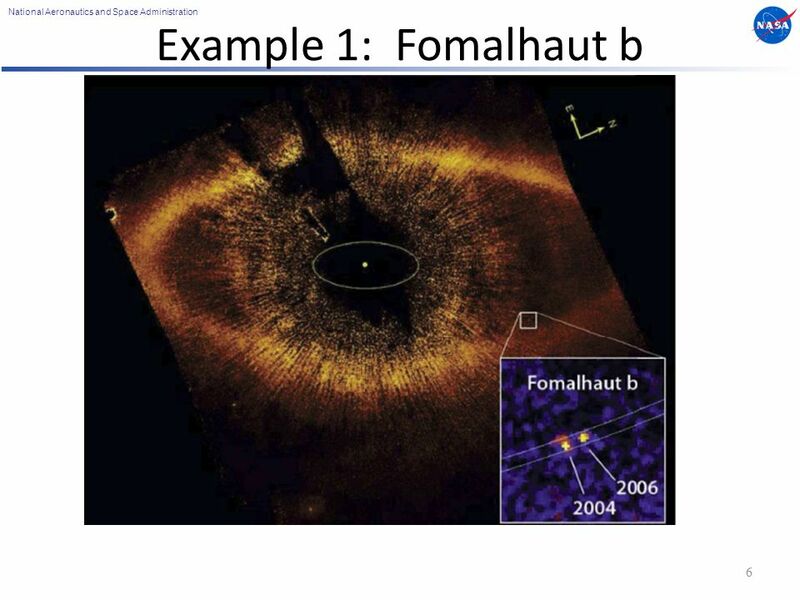 63 National Aeronautics and Space Administration Multi-speckle nulling 63 Suppose that we start with this (unknown) phase in the pupil. (1-D for illustration) Net result is 3N data points measured, and 2N unknowns, so we can solve for them, including the signs. 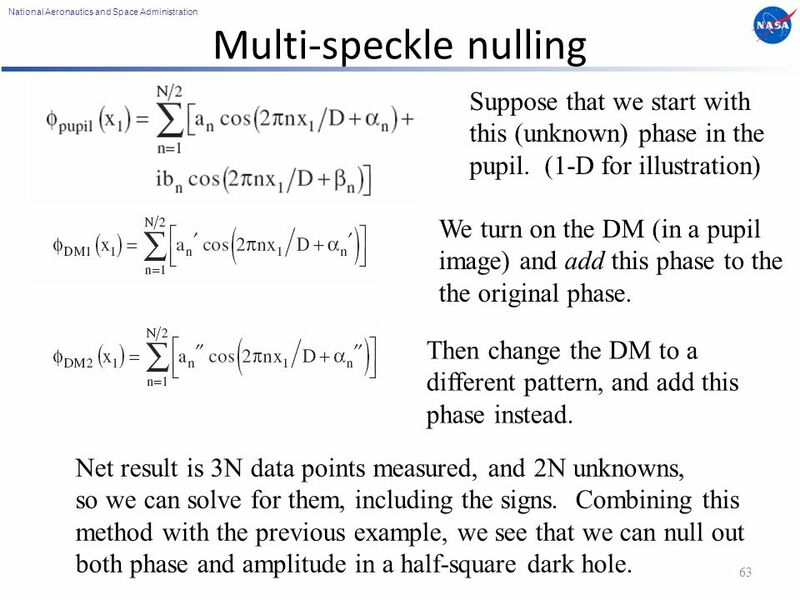 Combining this method with the previous example, we see that we can null out both phase and amplitude in a half-square dark hole. 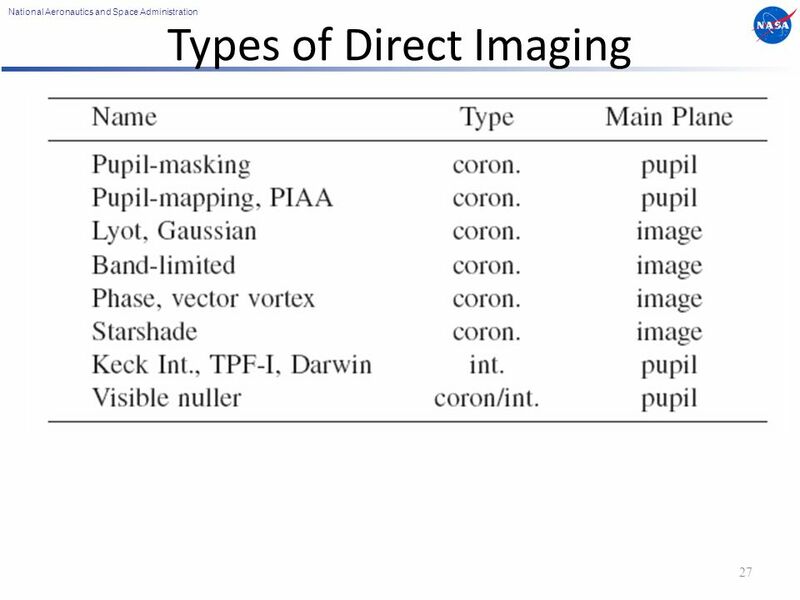 We turn on the DM (in a pupil image) and add this phase to the the original phase. Then change the DM to a different pattern, and add this phase instead. 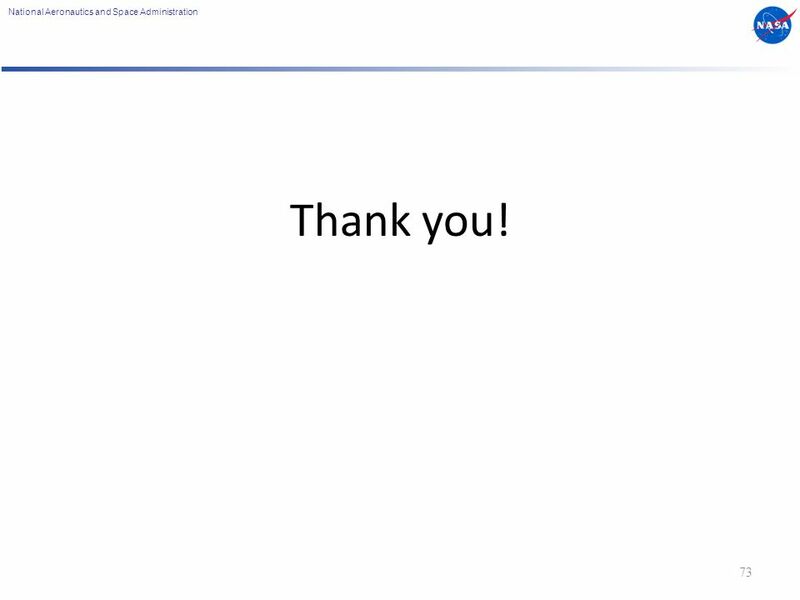 64 National Aeronautics and Space Administration Multi-speckle energy minimization (1/3) 64 Assume this is the unknown input phase. Φ 1 can be complex. This is the amplitude in plane 2, the image plane. Expand in a Fourier series. This is a DM just after this pupil. Expand in Fourier series. 65 National Aeronautics and Space Administration Multi-speckle energy minimization (2/3) 65 Insert phases, keep to 1 st order. 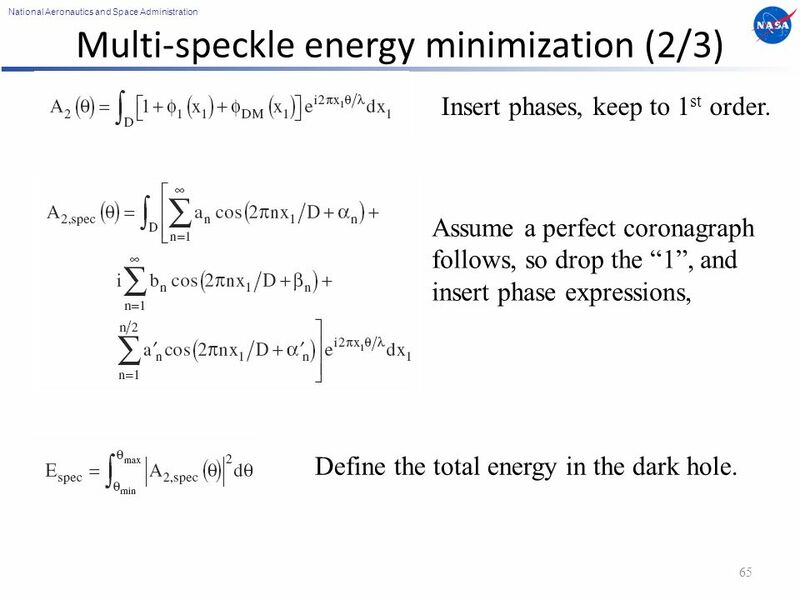 Assume a perfect coronagraph follows, so drop the “1”, and insert phase expressions, Define the total energy in the dark hole. 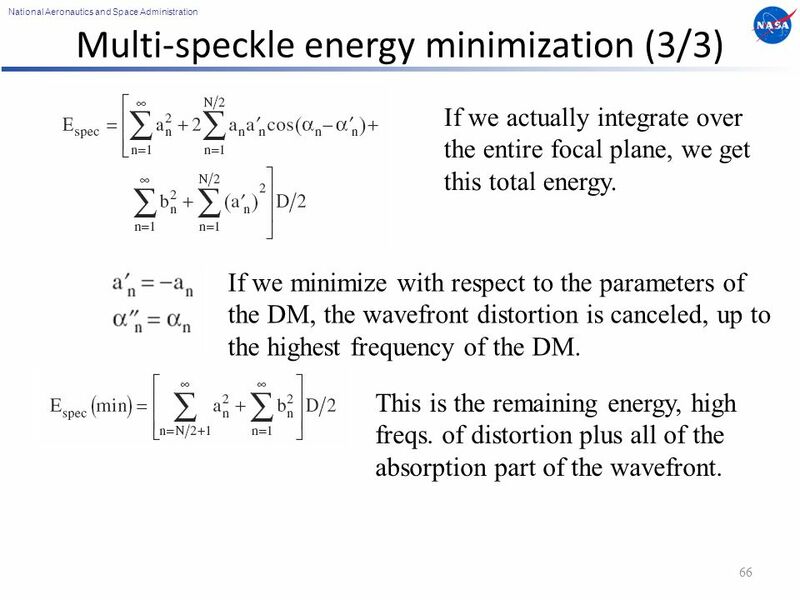 66 National Aeronautics and Space Administration Multi-speckle energy minimization (3/3) 66 If we minimize with respect to the parameters of the DM, the wavefront distortion is canceled, up to the highest frequency of the DM. 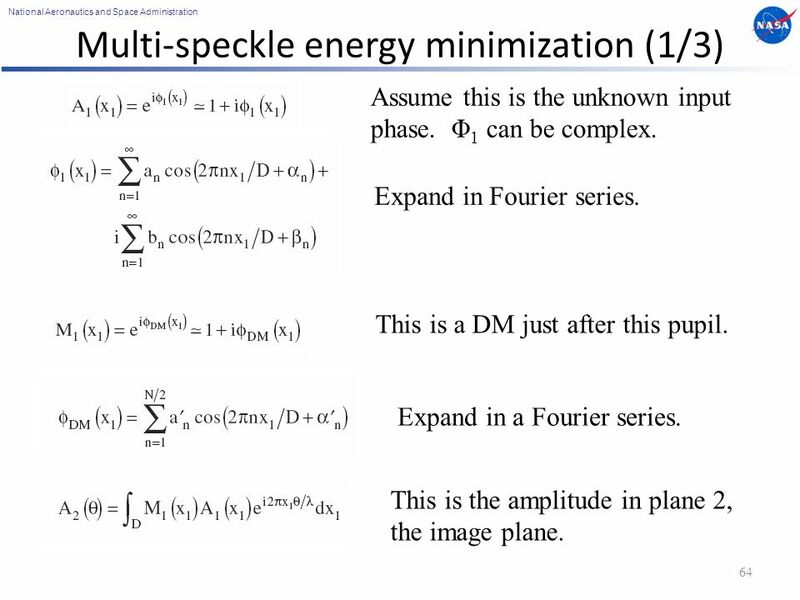 If we actually integrate over the entire focal plane, we get this total energy. This is the remaining energy, high freqs. of distortion plus all of the absorption part of the wavefront. 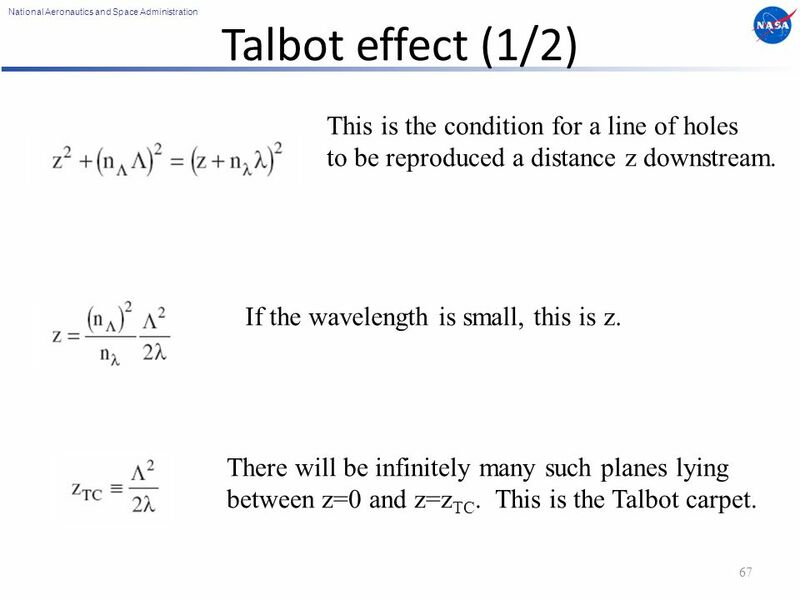 67 National Aeronautics and Space Administration Talbot effect (1/2) 67 This is the condition for a line of holes to be reproduced a distance z downstream. There will be infinitely many such planes lying between z=0 and z=z TC. This is the Talbot carpet. 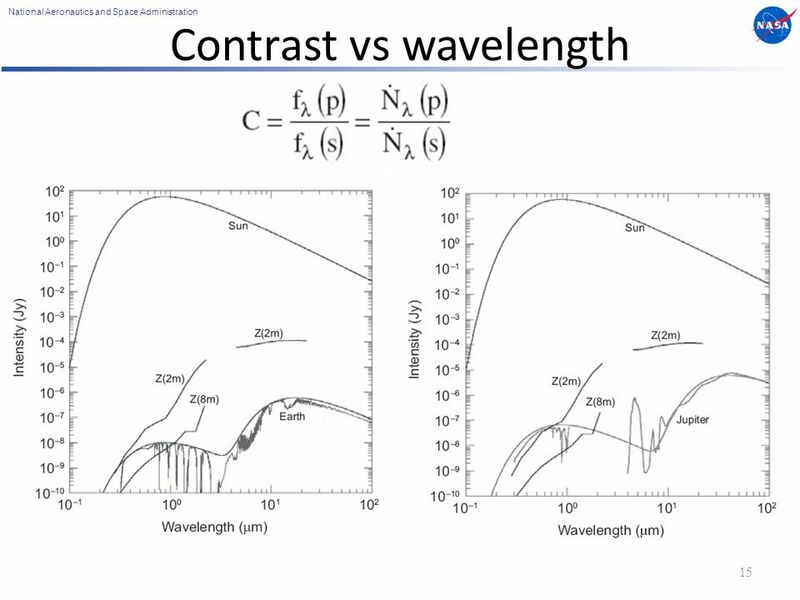 If the wavelength is small, this is z. 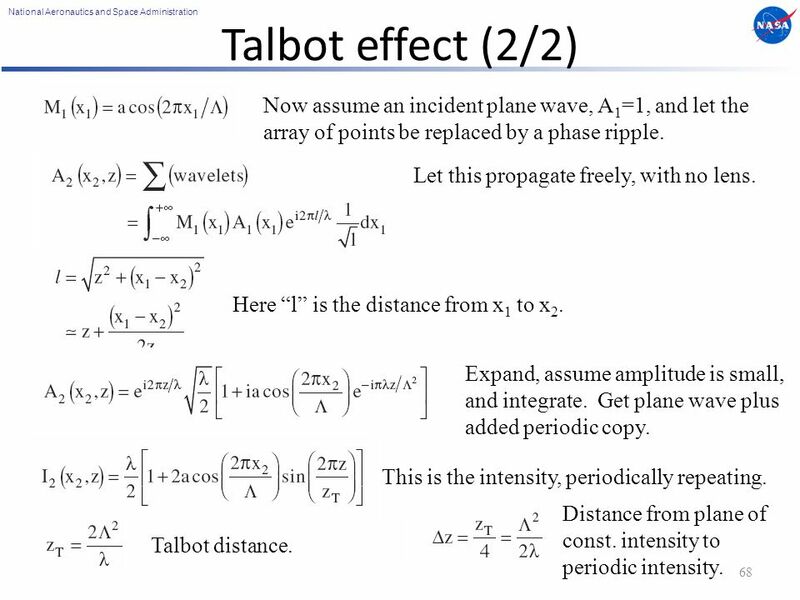 68 National Aeronautics and Space Administration Talbot effect (2/2) 68 Now assume an incident plane wave, A 1 =1, and let the array of points be replaced by a phase ripple. Let this propagate freely, with no lens. Here “l” is the distance from x 1 to x 2. Expand, assume amplitude is small, and integrate. 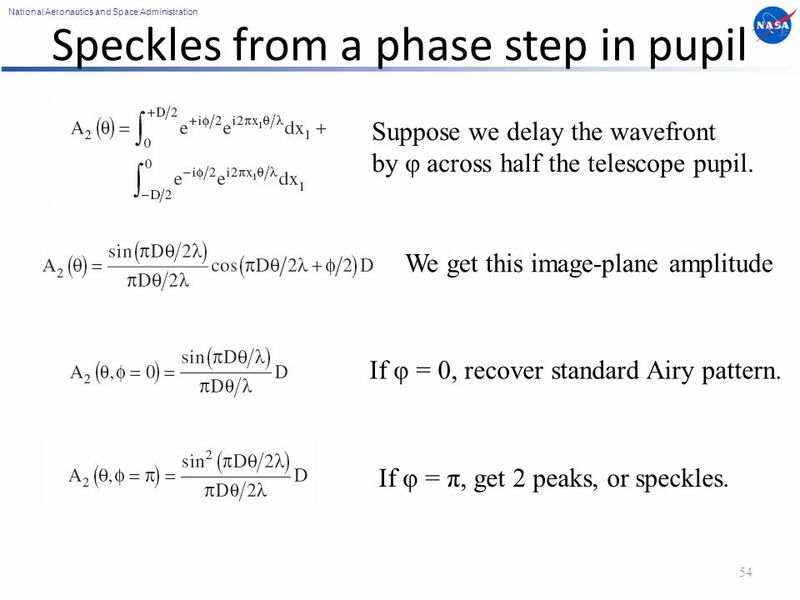 Get plane wave plus added periodic copy. This is the intensity, periodically repeating. Talbot distance. Distance from plane of const. 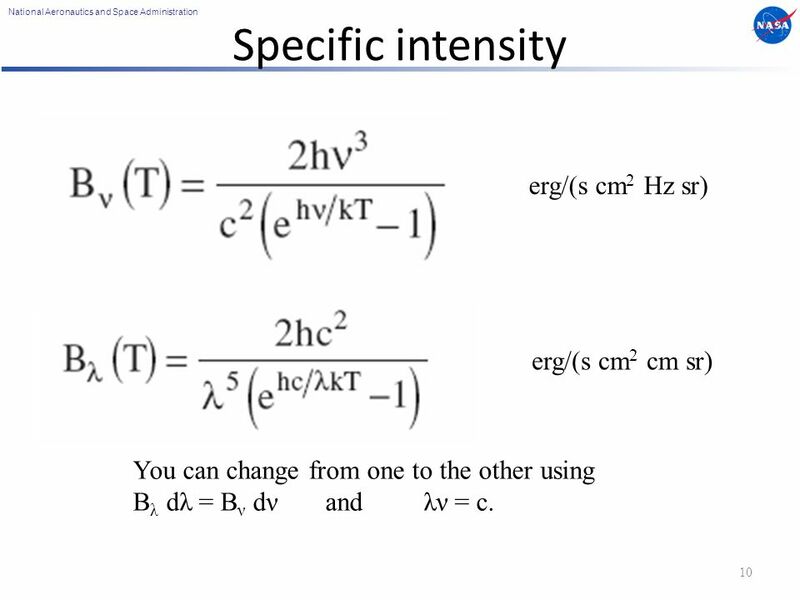 intensity to periodic intensity. 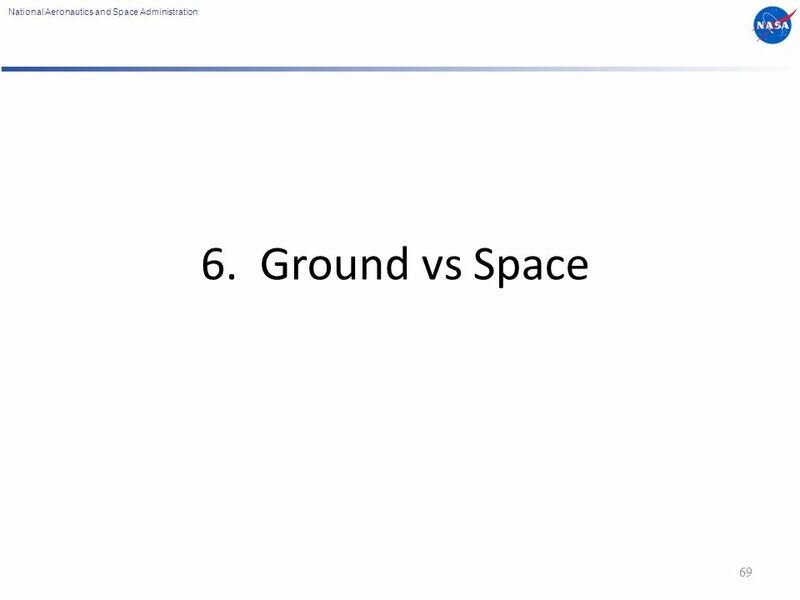 70 National Aeronautics and Space Administration Ground vs space direct imaging 70 See text for full explanation. 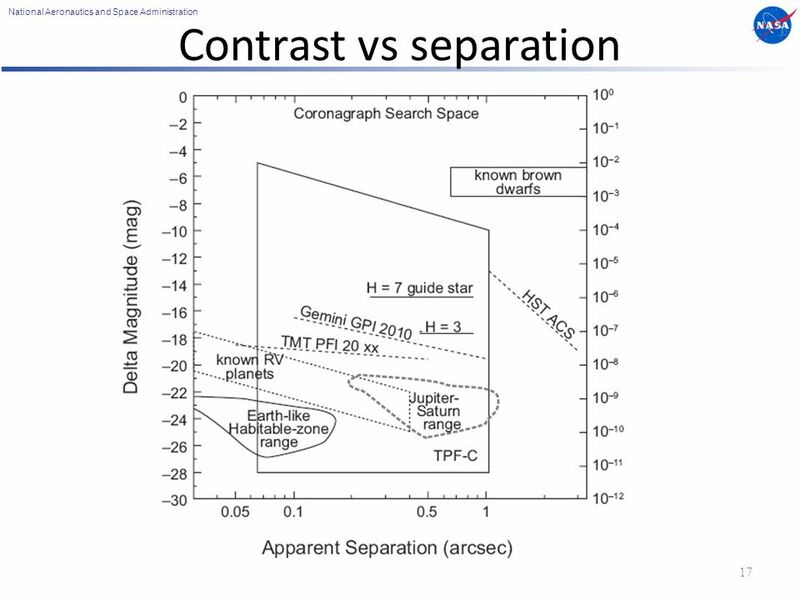 Bottom line: to achieve 10 -10 contrast at a ground-based telescope would seem to require a star brighter than any that exist, according to the above logic. Even if there is a way to solve this problem, it will likely not be easy. 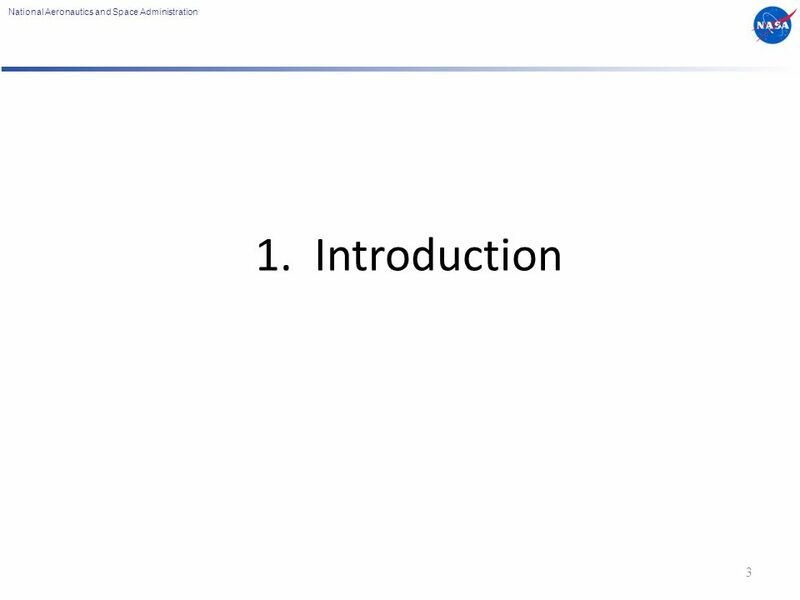 Download ppt "National Aeronautics and Space Administration 1 Traub Principles of Coronagraphy Wesley A. Traub Jet Propulsion Laboratory, California Institute of Technology." 24.6 Diffraction Huygen’s principle requires that the waves spread out after they pass through slits This spreading out of light from its initial line. Wave Behavior Another McGourty-Rideout Production. 1 Phys 2310Fri. 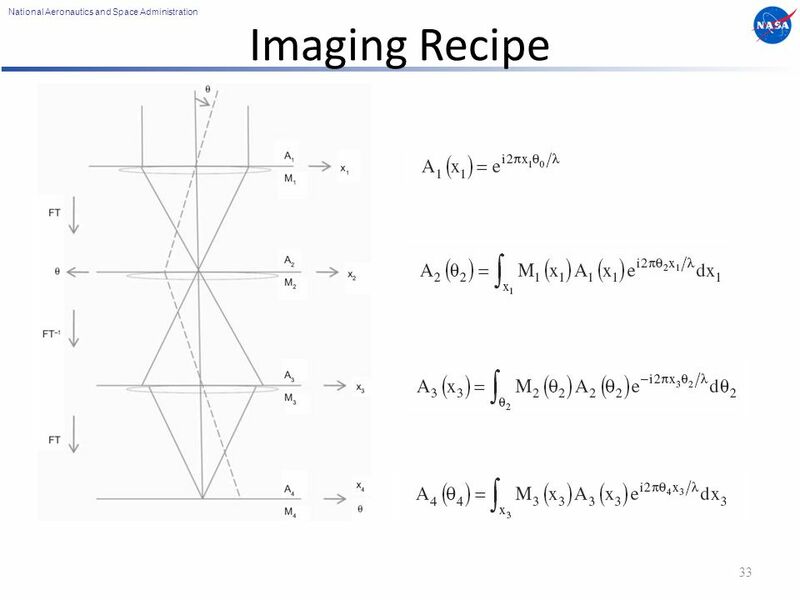 Nov. 18, 2011 Today’s Topics Begin Chapter 10: Diffraction Reading for Next Time TexPoint fonts used in EMF. Read the TexPoint manual before. Lesson 3 METO 621. 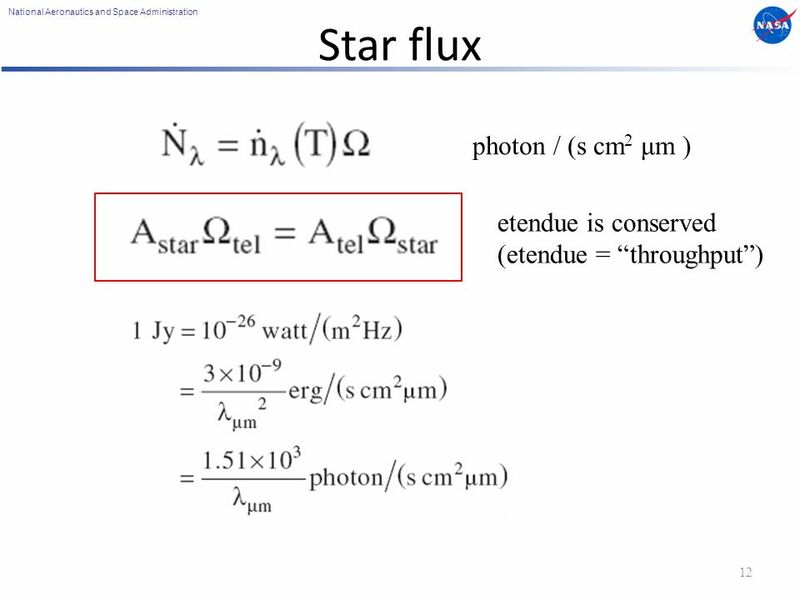 Basic state variables and the Radiative Transfer Equation In this course we are mostly concerned with the flow of radiative energy. 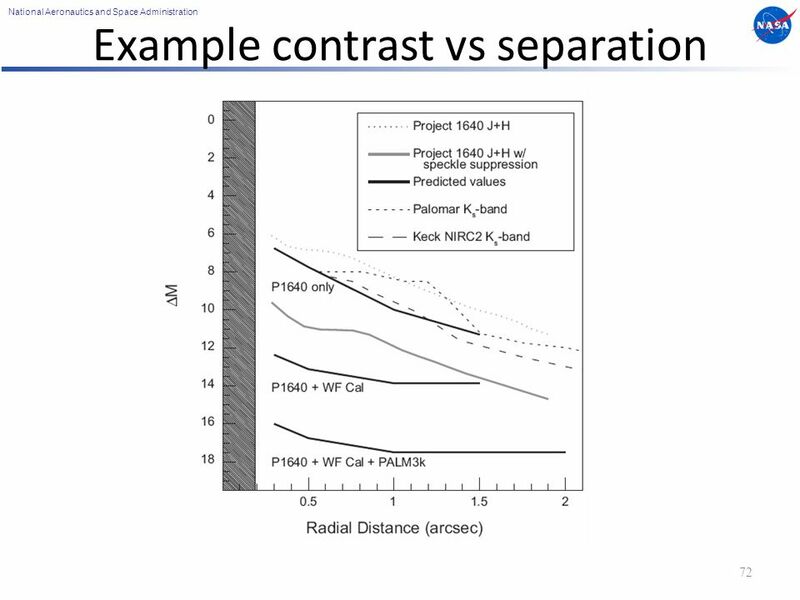 Understanding interferometric visibility functions J. Meisner. Chapter 11: Fraunhofer Diffraction. 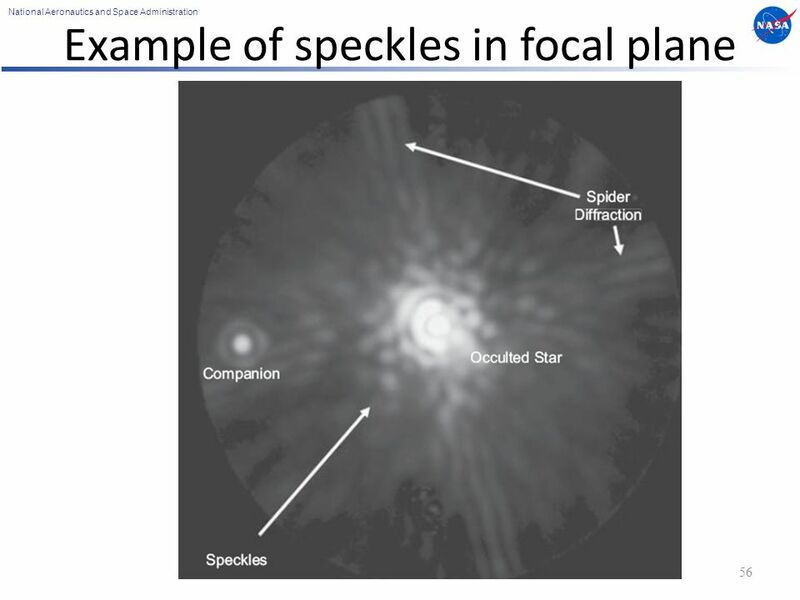 Diffraction is… Diffraction is… interference on the edge -a consequence of the wave nature of light -an interference. Waves and Light. A wave is a pattern that moves. A wave is a pattern that moves. As the pattern moves, the medium may “jiggle”, but on average it stays. 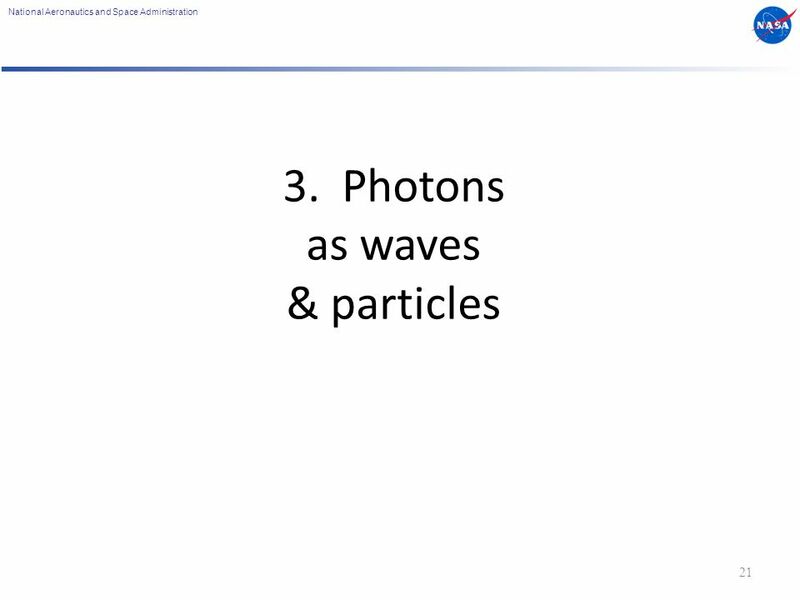 Lecture 24 Physics 2102 Jonathan Dowling EM waves Geometrical optics. Chapter 5 Telescopes: “light bucket”. 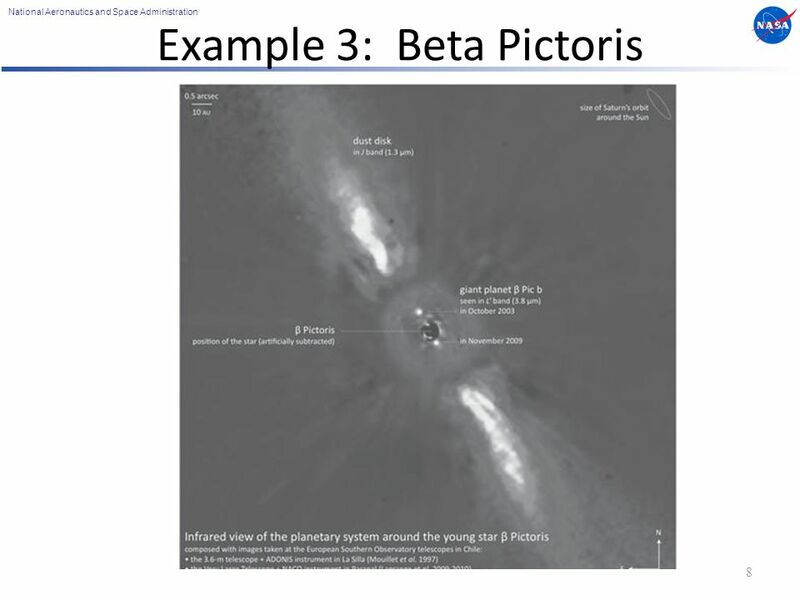 Telescopes have three functions 1.Gather as much light as possible: LGP ∝ Area = πR 2 LGP ∝ Area = πR 2 Why? Why?